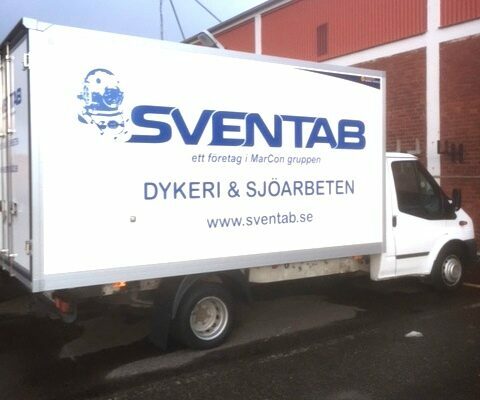 SVENTAB now a mobile divestation in this divebus. 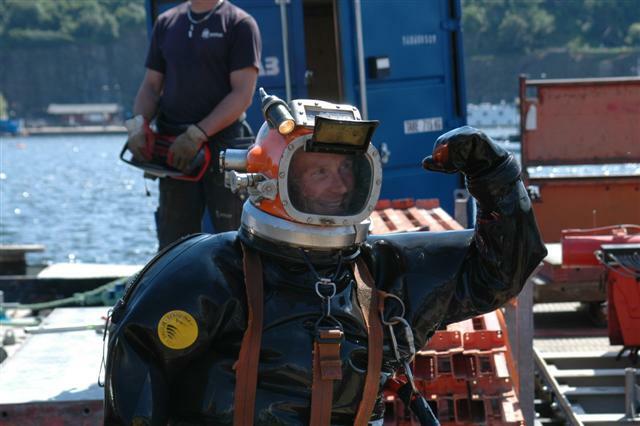 We will quickly come to customers who need assistance with diving assignment. 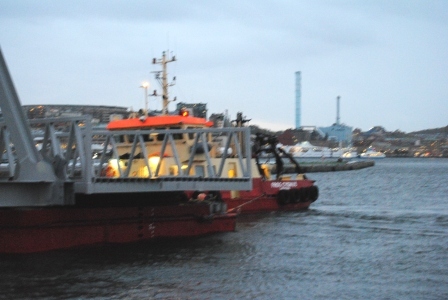 SSE has worked as subcontractor to Baltic Offshore for Svenska Kraftnät. 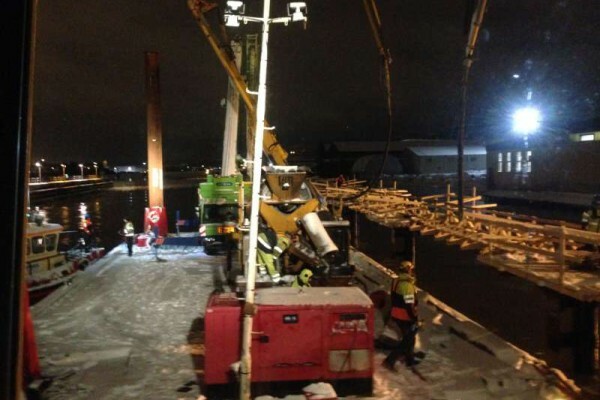 Towing and installation of river channelisation for cabling for the new Marieholm bridge. 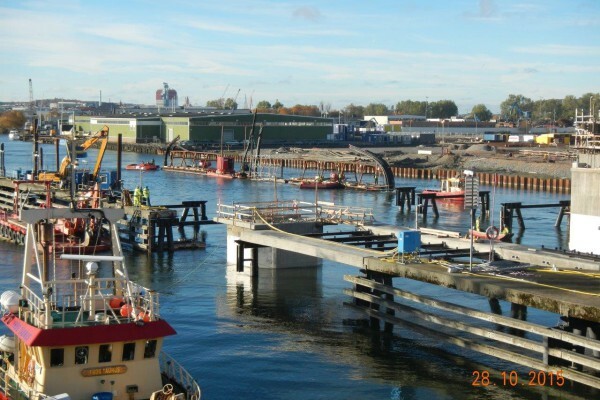 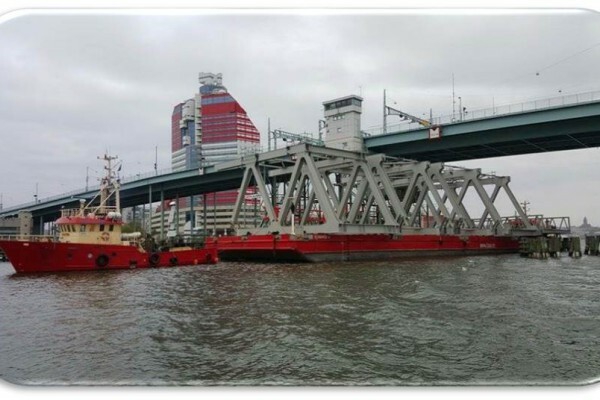 FMS has, while using Frog Taurus, Frog Rana and workboats, been responsible for towing and installation of river channelisation for wires to the new Marieholms bridge. 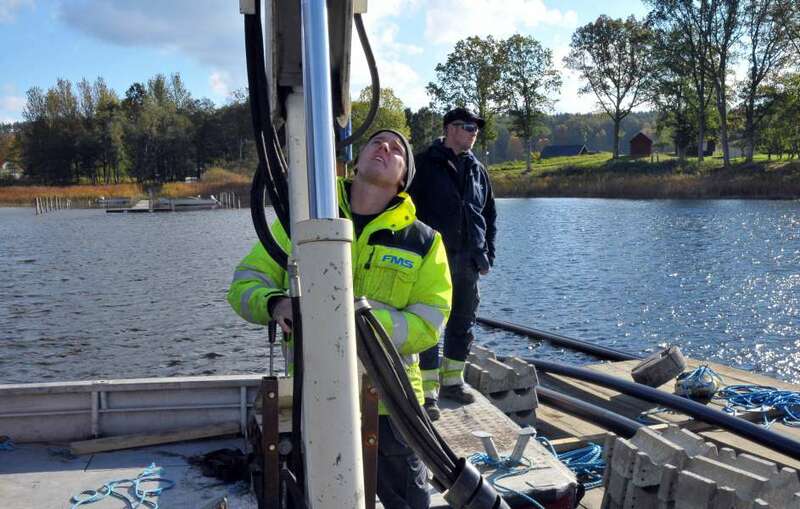 FMS contributes to boosting relations over the river and thus ease the flow of traffic in western Sweden. 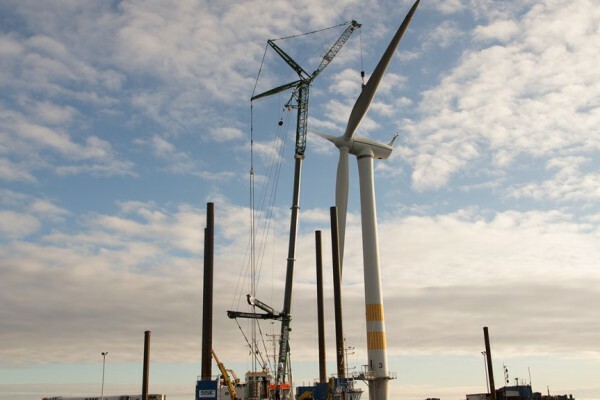 SSE as prime contractor has successfully completed the dismantling of five wind turbines. 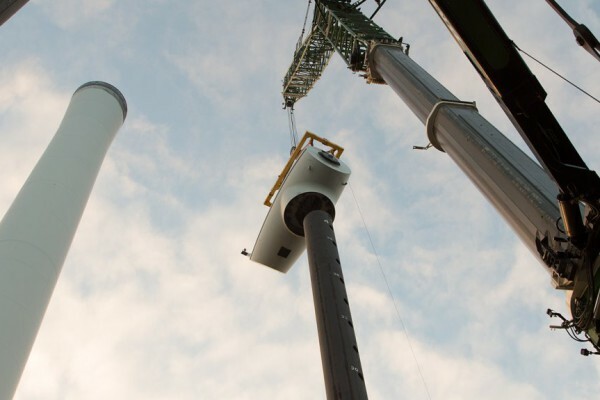 We have dismantled and lifted down the rotor blades, turbine and tower. 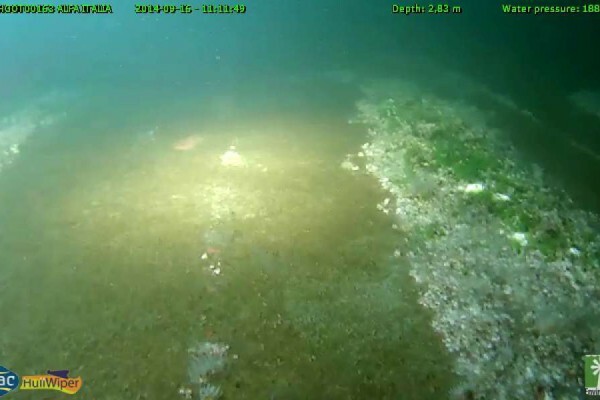 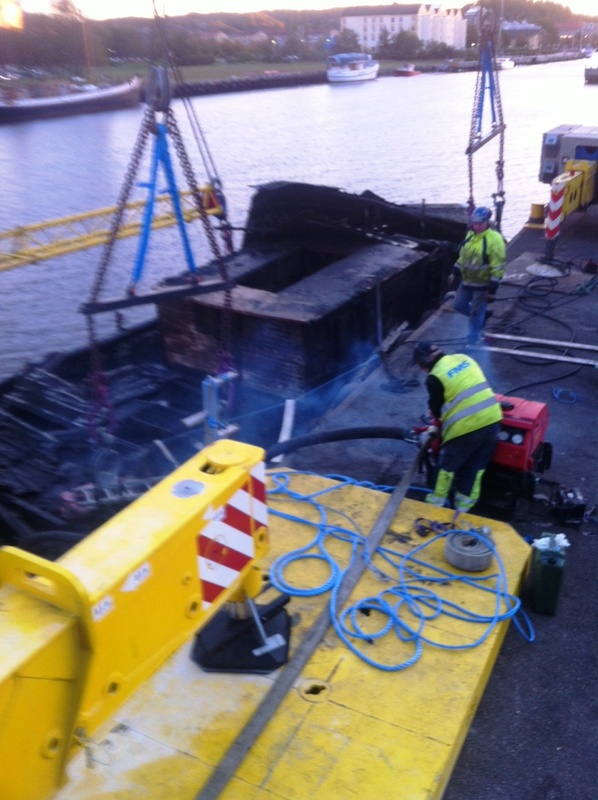 We have aslo chopped off foundations in level with the seabed. 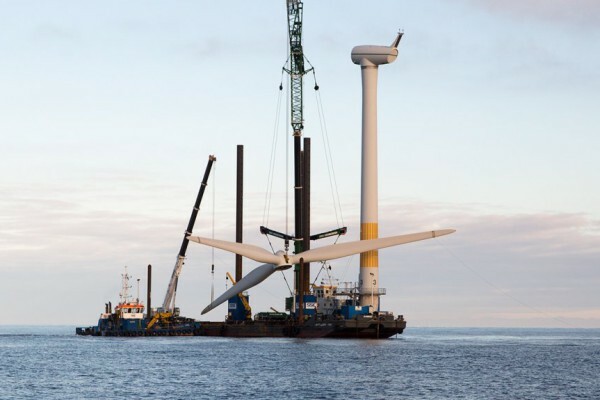 This is the first time in the world that an offshore wind farm gets dismantled! 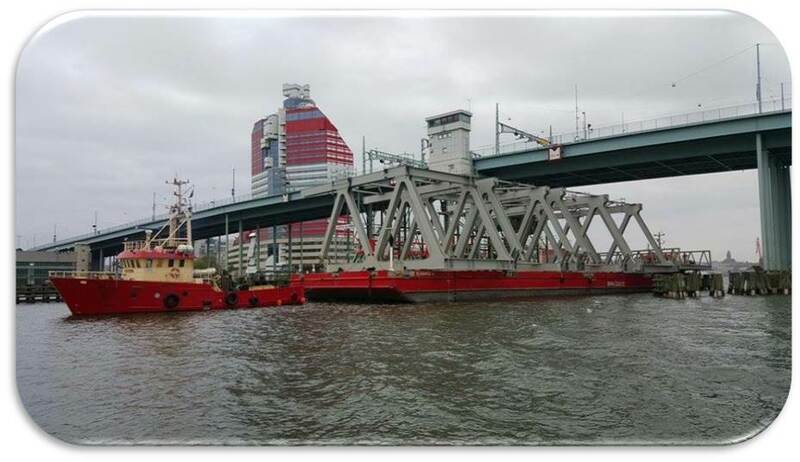 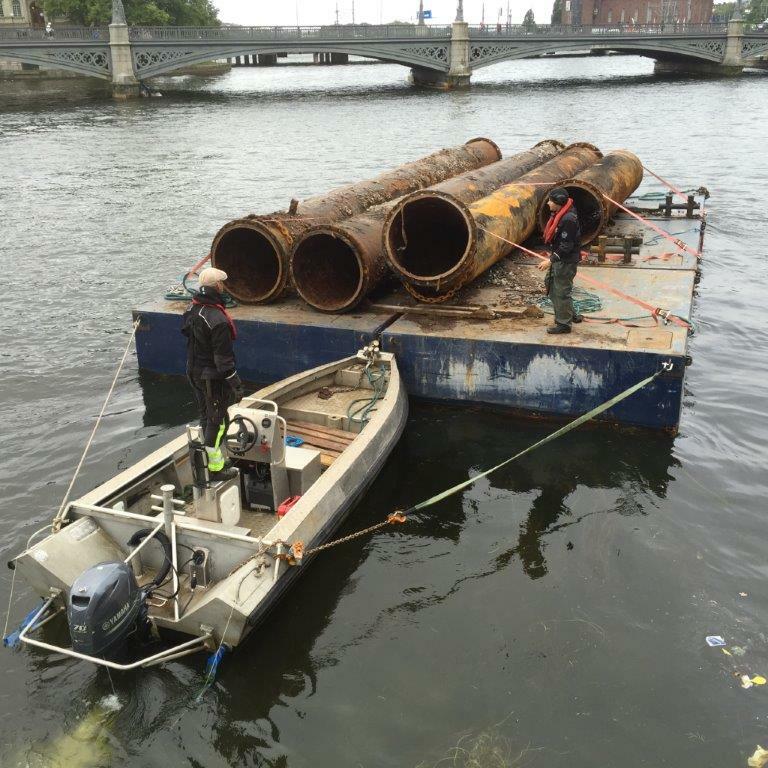 FMS has with the help of Frog Cygnus and Frog Rana assisted in towing large bridge elements to the new Marieholm connection. 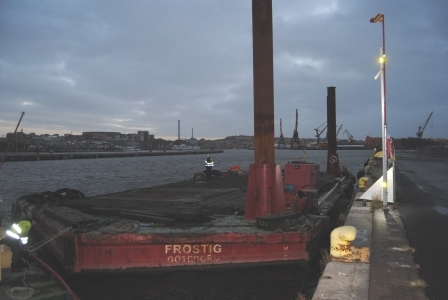 The safely performed mooring took place by our barge Frostig. 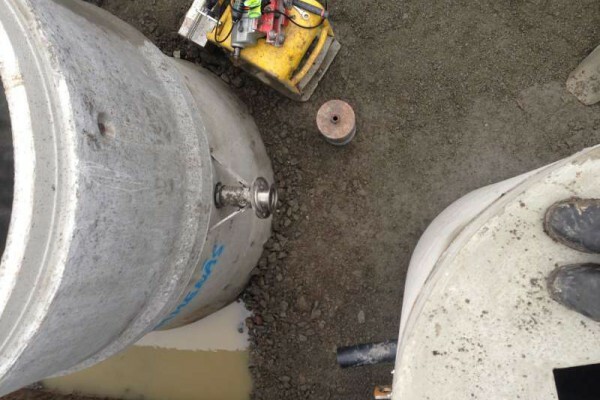 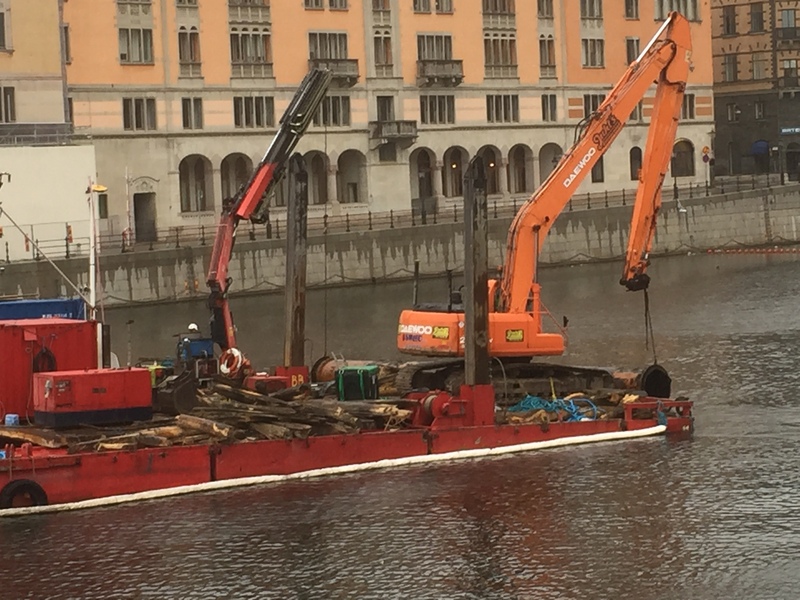 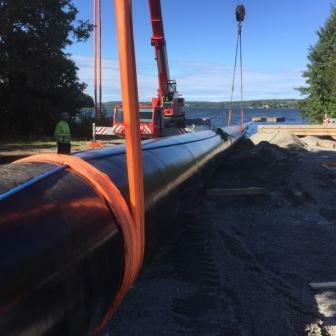 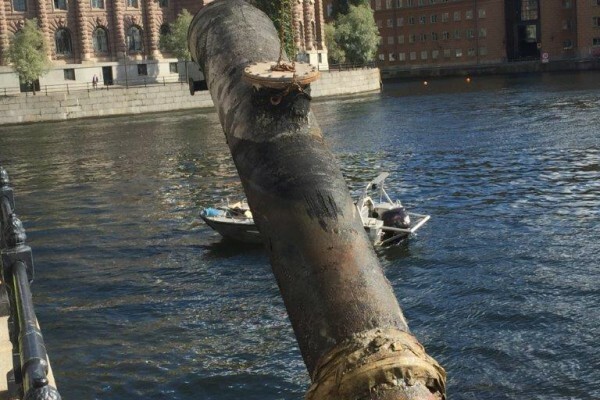 SVENTAB has excavated an old water main for STOCKHOLM VATTEN and performed quay work etc.. A new 140 meters steel line, diameter 1000 mm, has been welded together in Norsborg, towed into place, assembled and excavated. 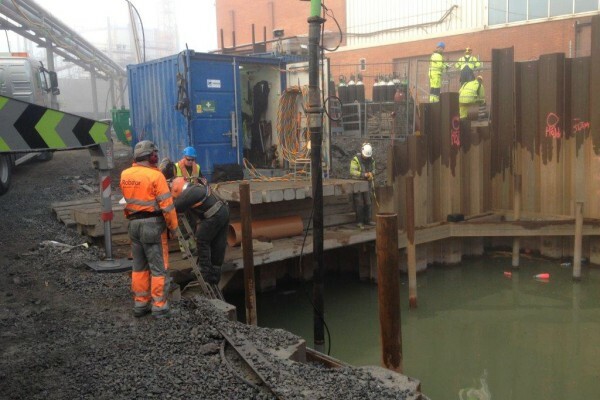 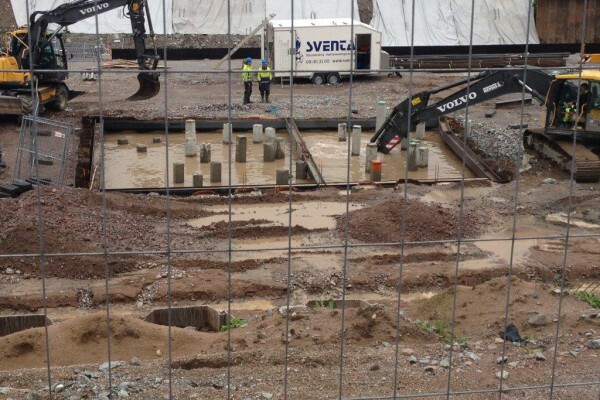 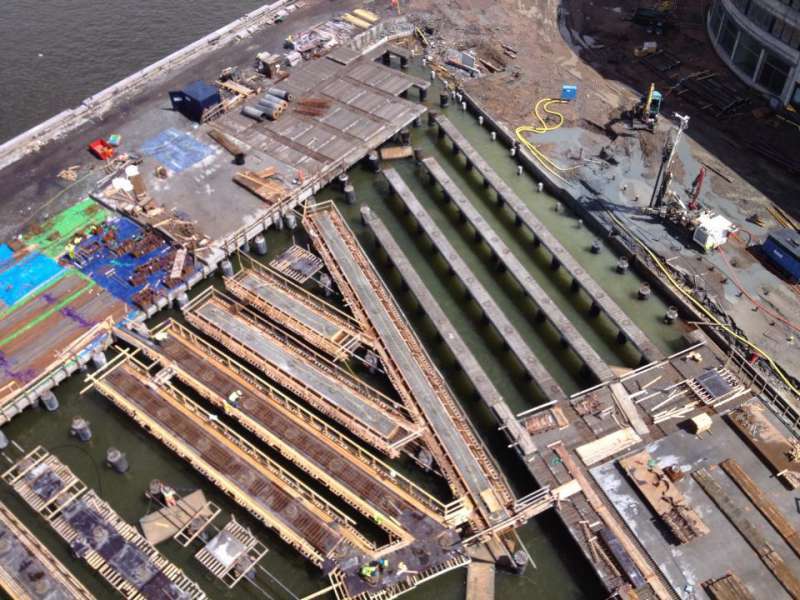 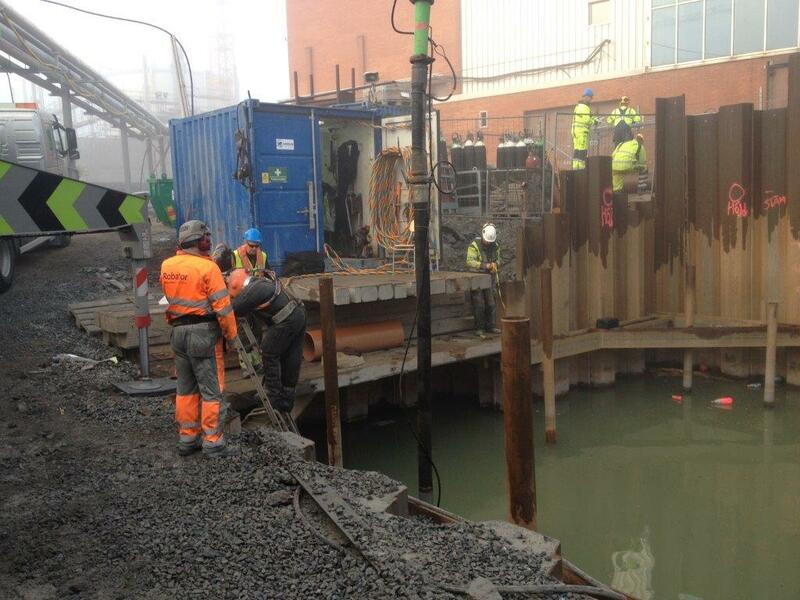 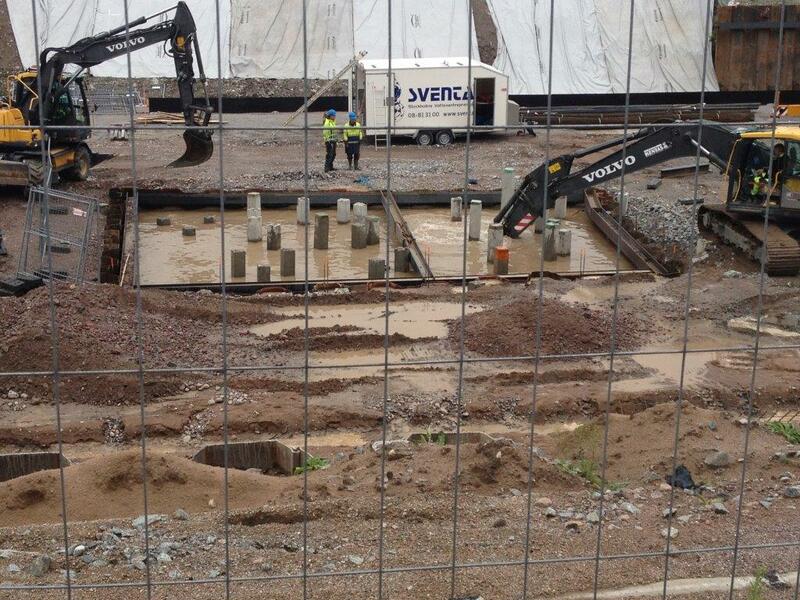 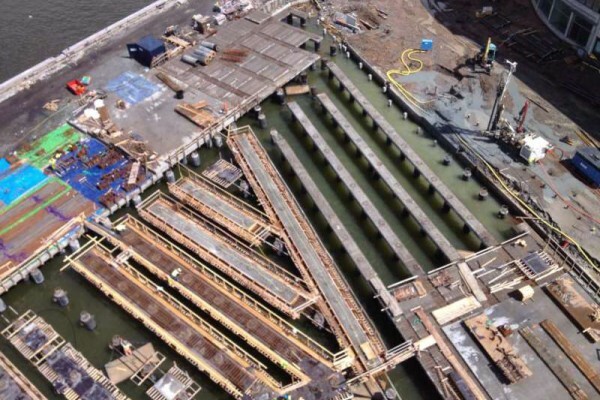 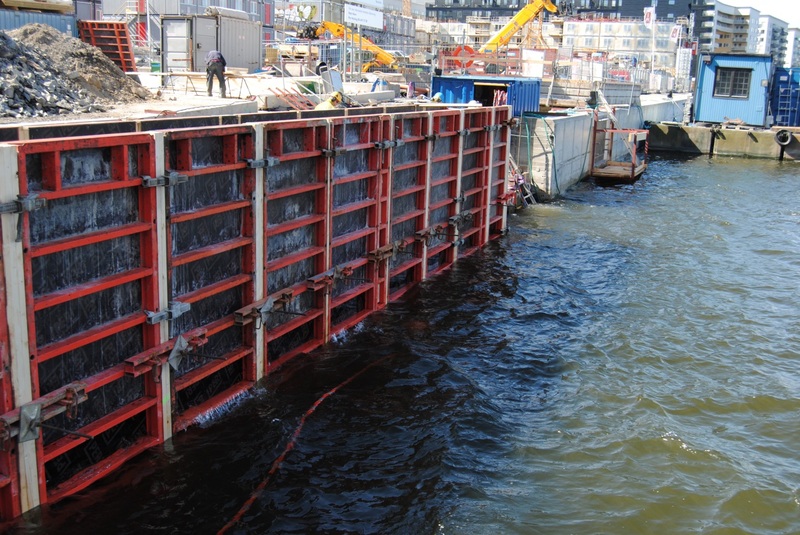 SKANSKA was a subcontractor working with extensive quay work. 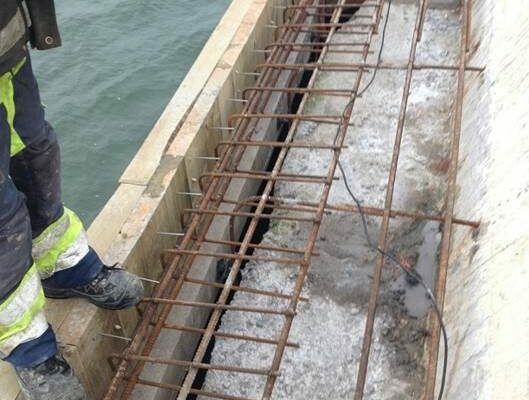 This is an excellent execution of collaboration between contractors. 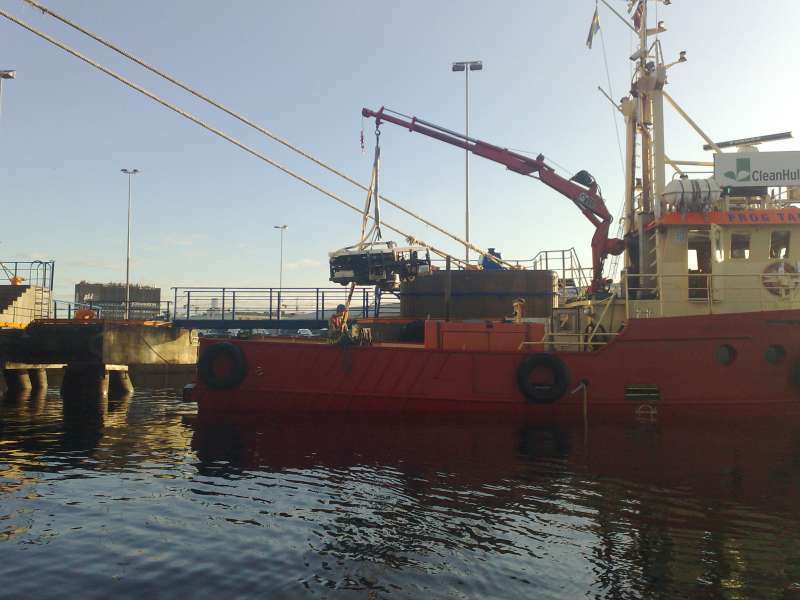 FMS has successfully salvaged an old motor fishing vessel from 1950 that has been sunk for about two years at the Juno quay in Uddevalla. 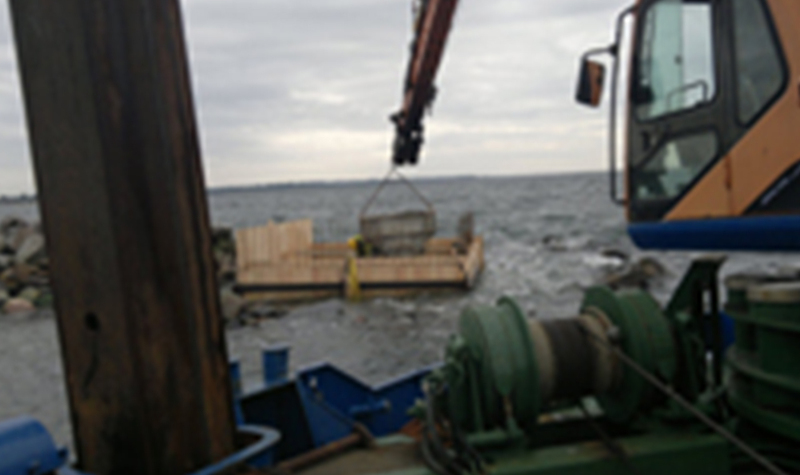 The clients were Kronofogden and Uddevalla kommun. 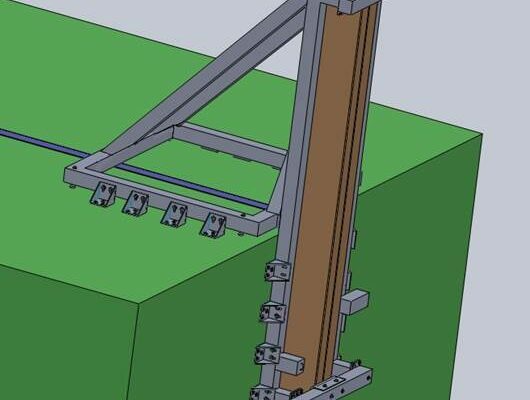 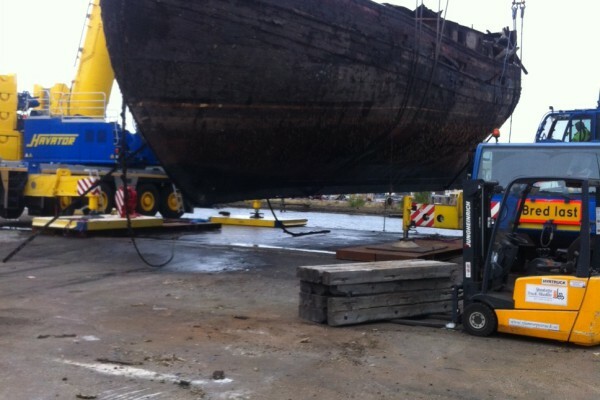 The ship was 22.5 x 6.5 meters with a draft of 3.5 meters. 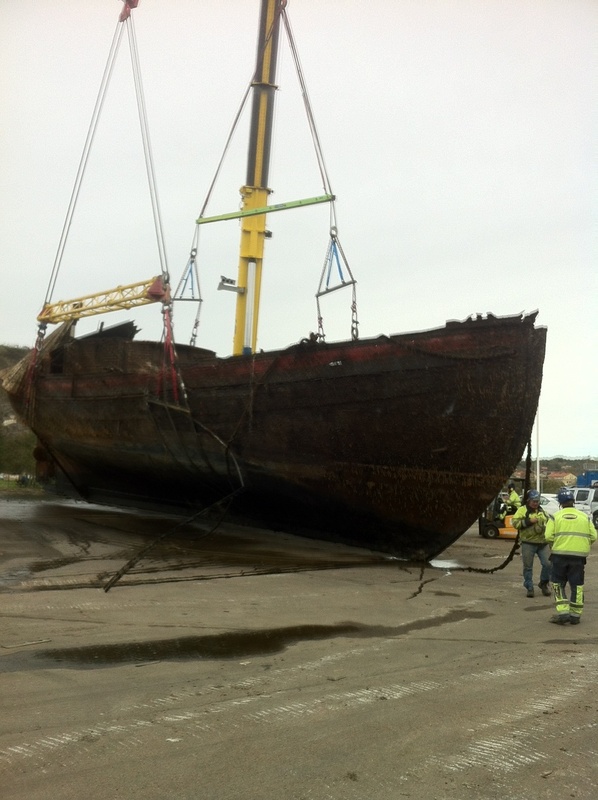 The ship weighed 135 tons after we pumped out the water and sludge sucked. 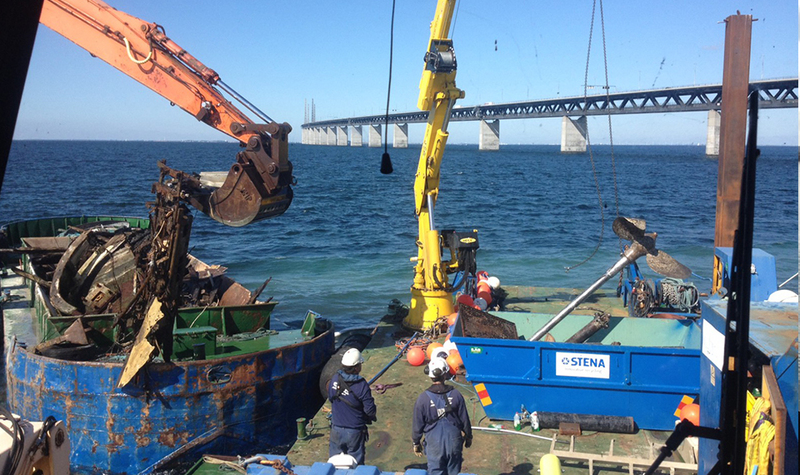 We rented Mobile cranes from Havator. 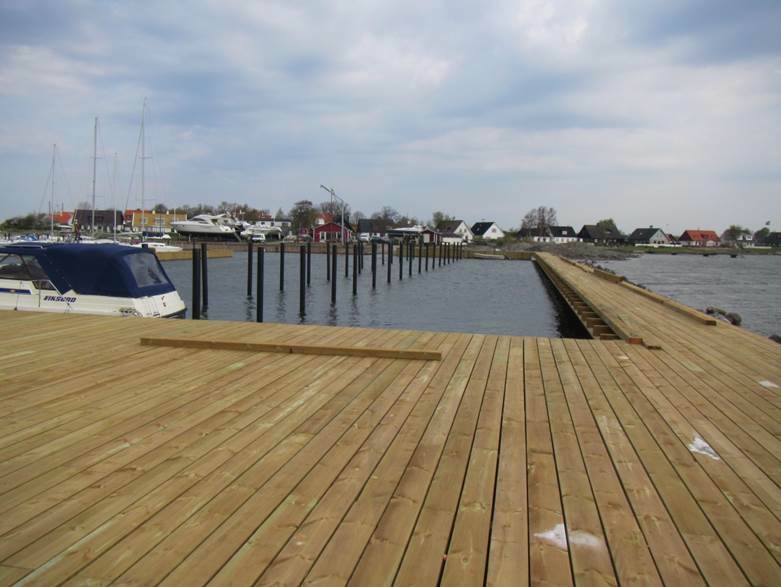 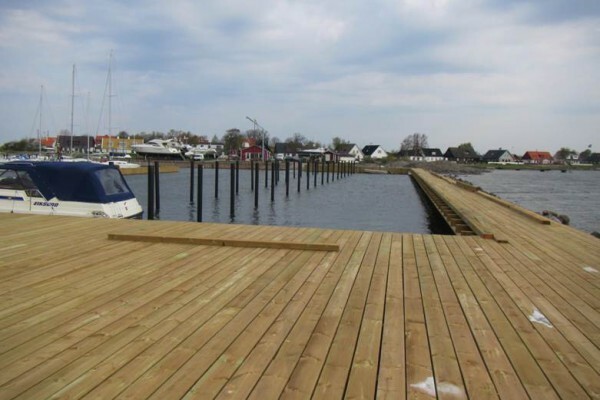 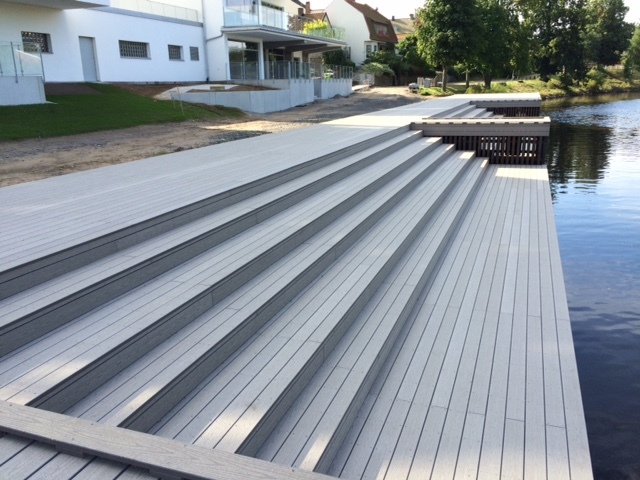 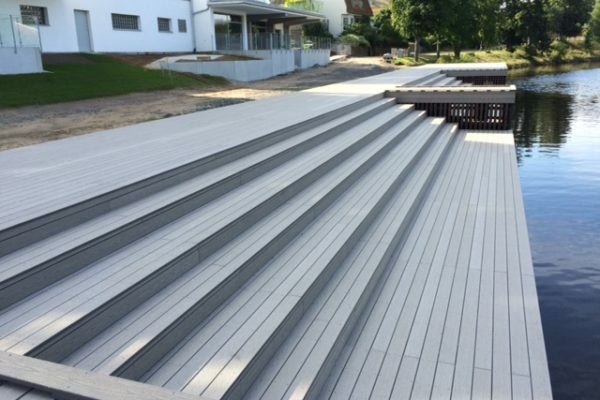 We have built and completed a big and elegant pier, 55 x 7 meters, along “åpromenaden” by newly built house with apartments. 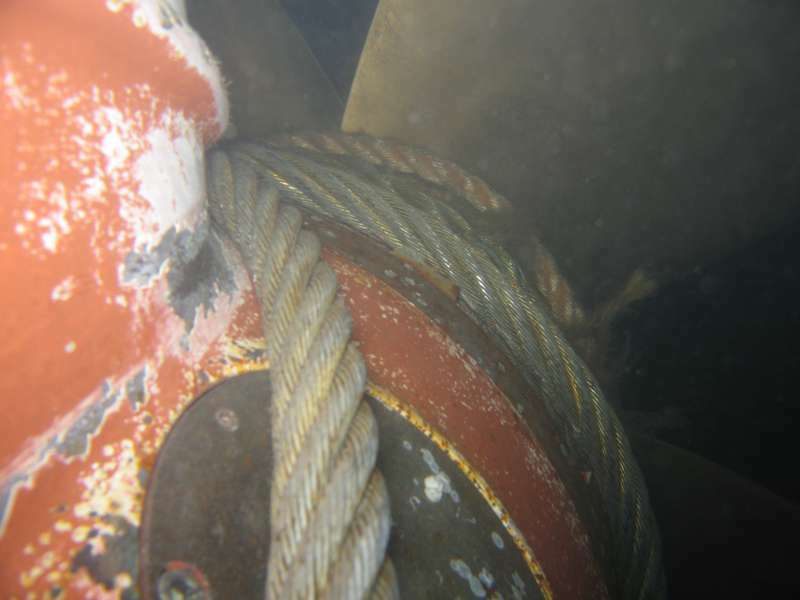 For increased propeller efficiency and reduced fuel consumtion we perform propeller polishing and hull cleaning. 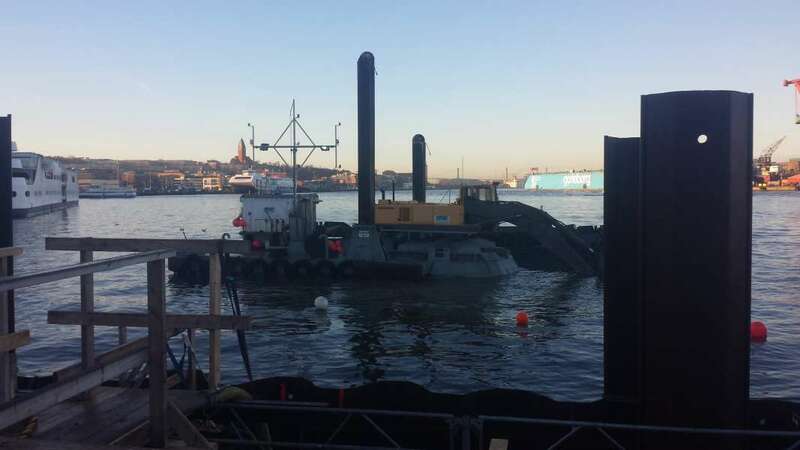 SVENTAB perform on behalf of JM a bulldozer and dense casting groovegroup Frösunda, Stockholm. 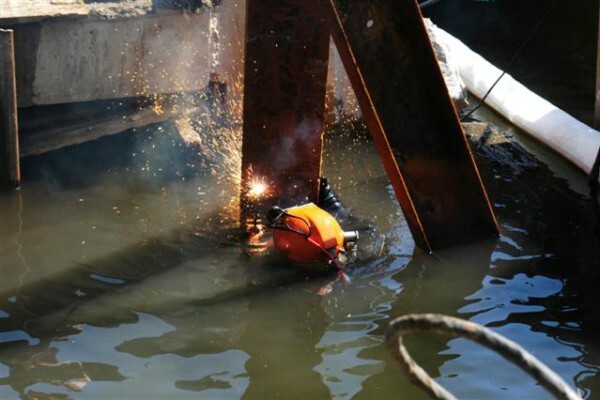 The workforce consisted of a Dive Team who rinsed steel sheet piles, leveled bottom ink UV casting. 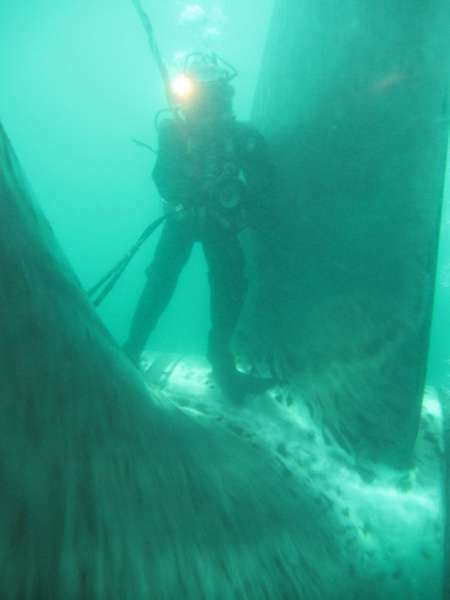 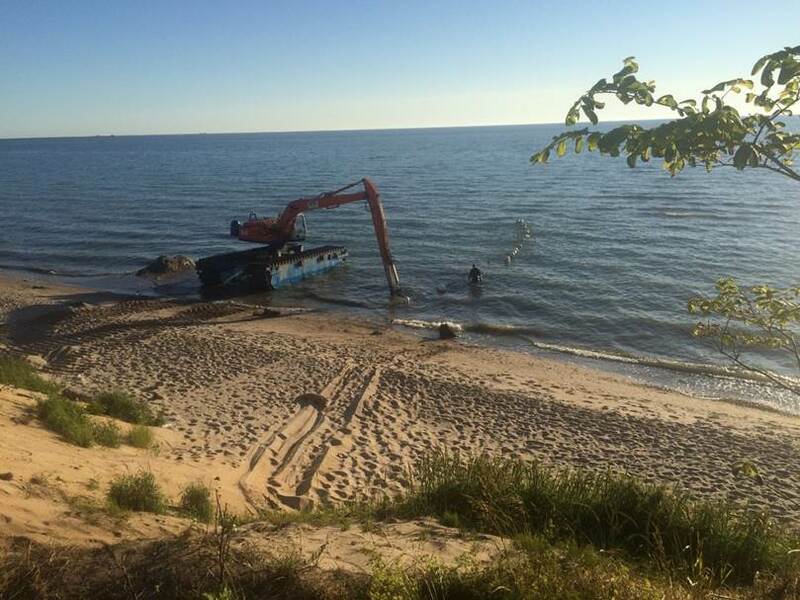 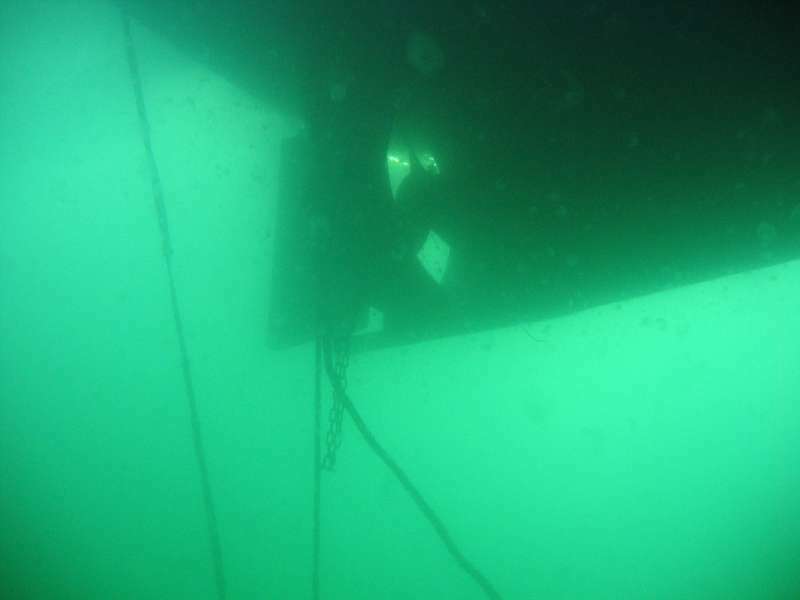 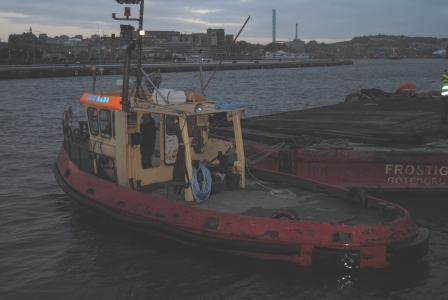 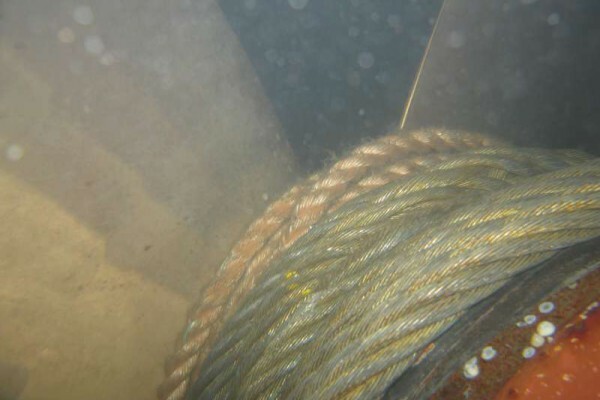 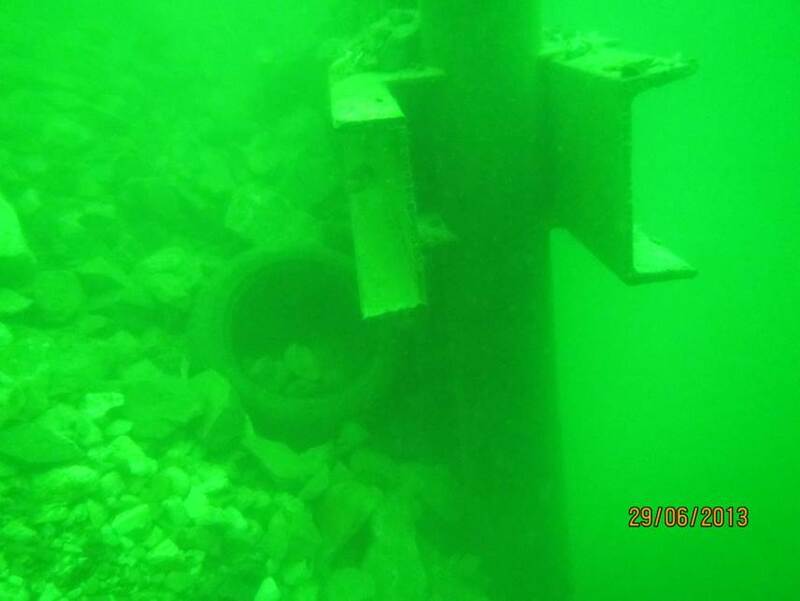 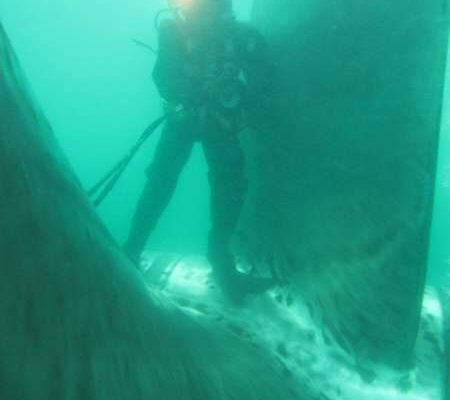 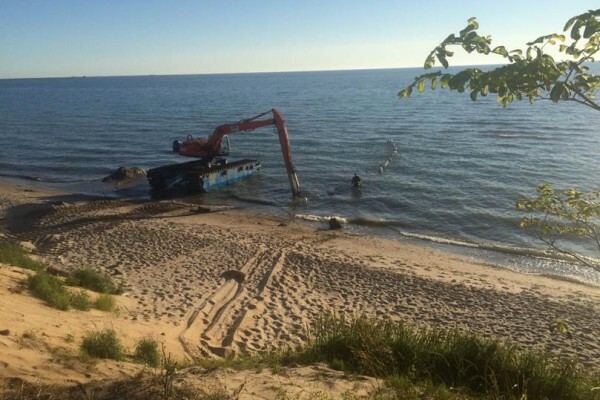 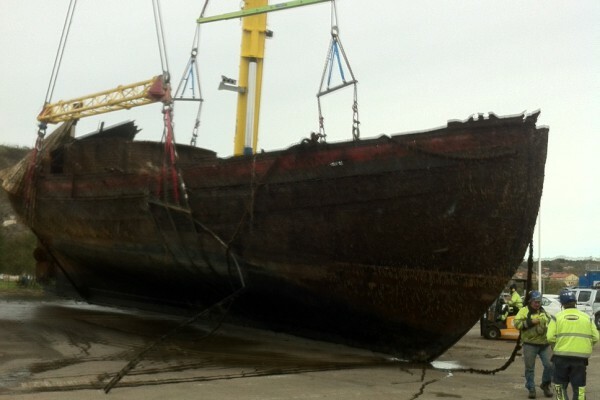 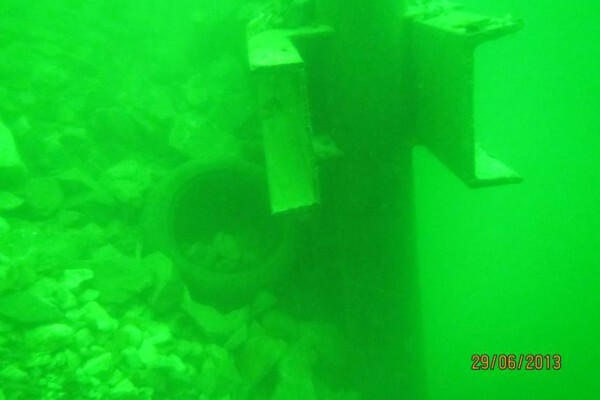 SSE has successfully salvaged and destroyed a fishing motor vessels on behalf of the Swedish Enforcement Authority. 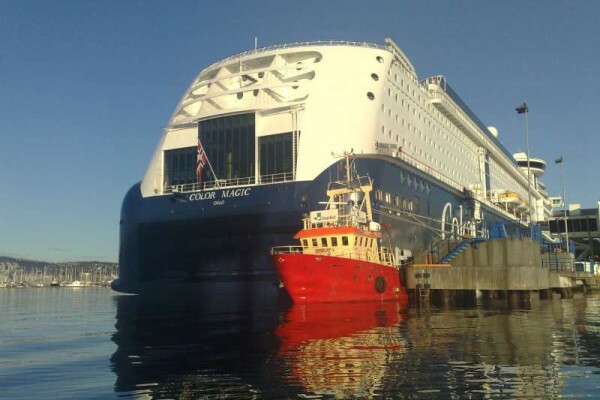 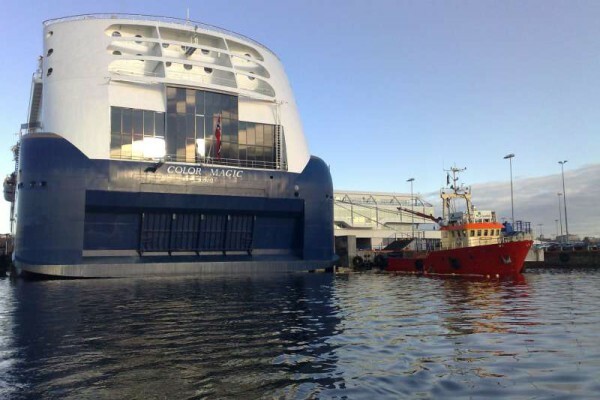 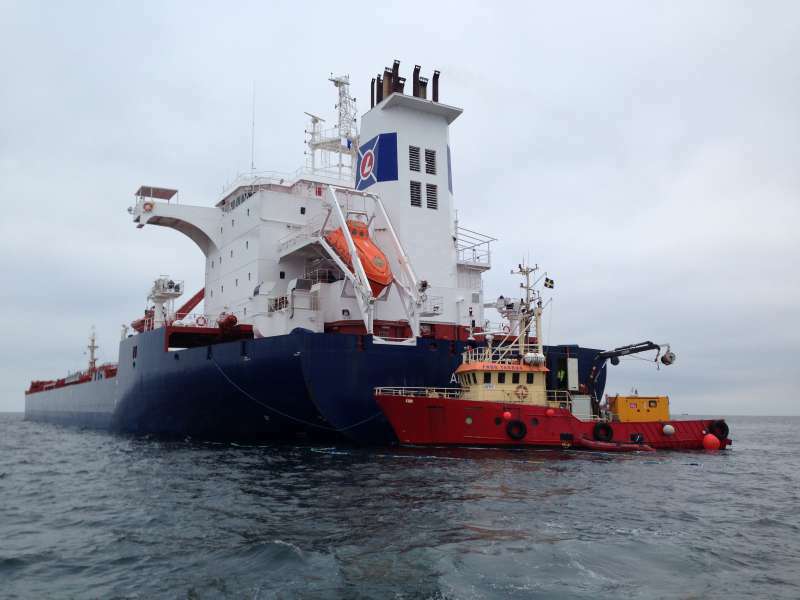 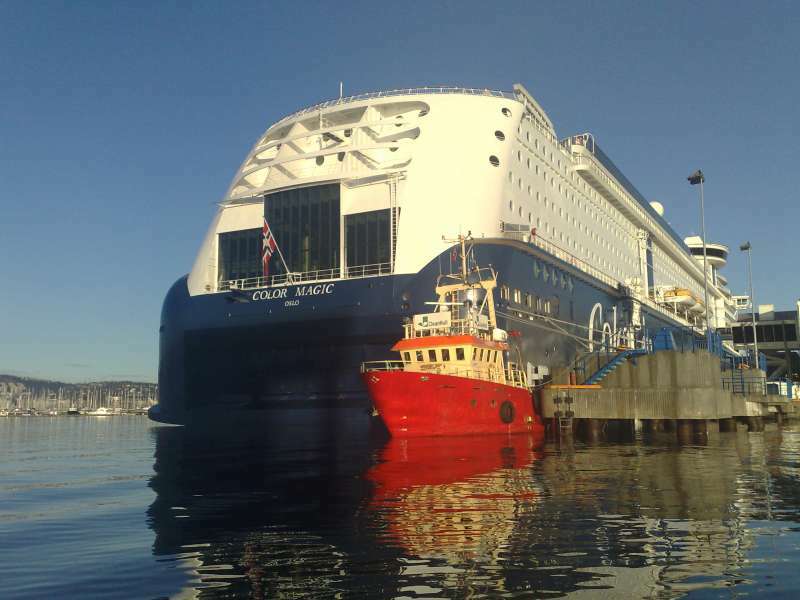 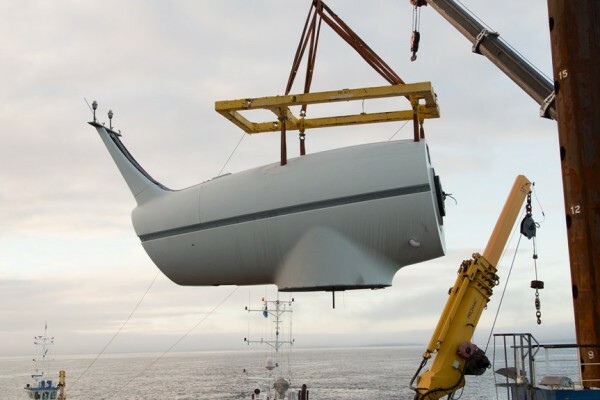 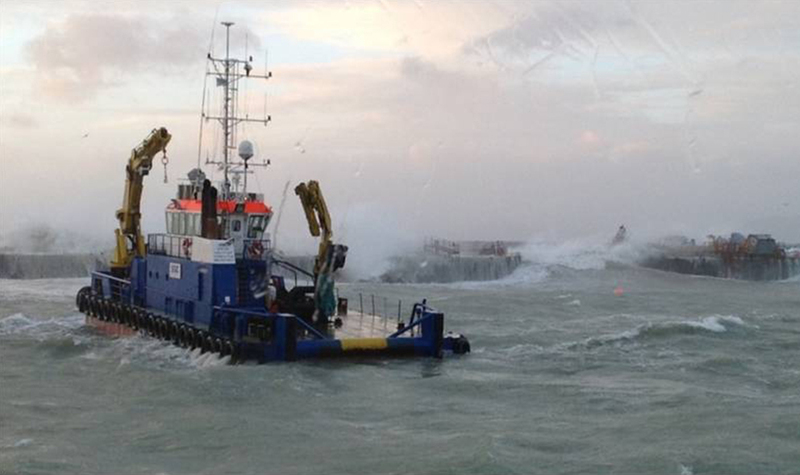 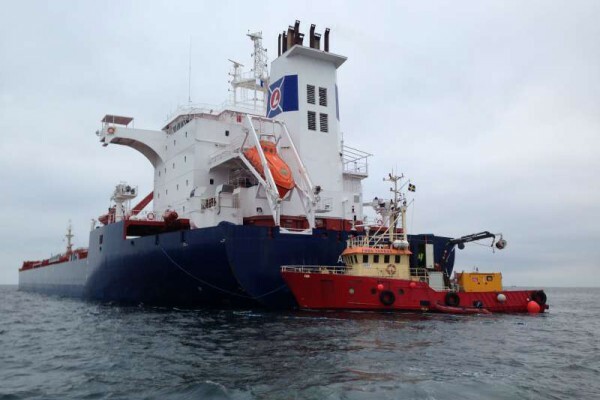 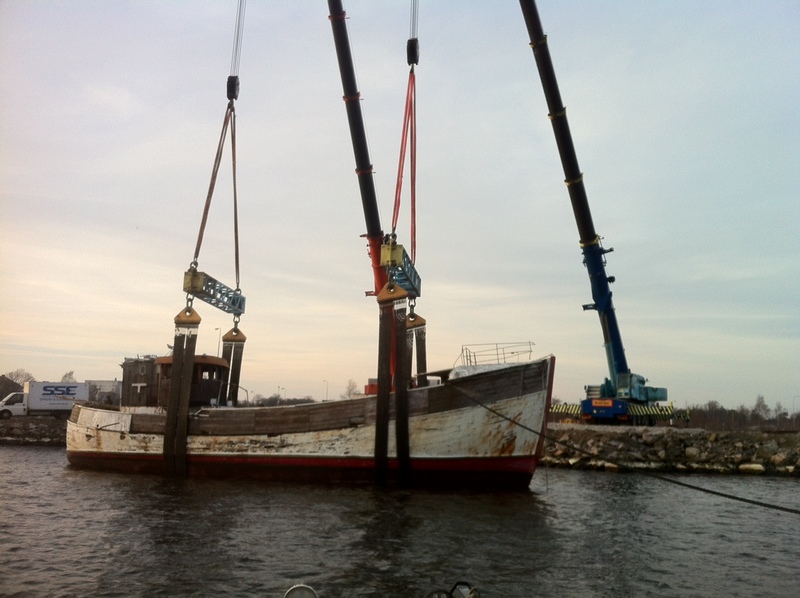 The ship was in poor condition and two large mobile cranes helped SSE lift ship on land. 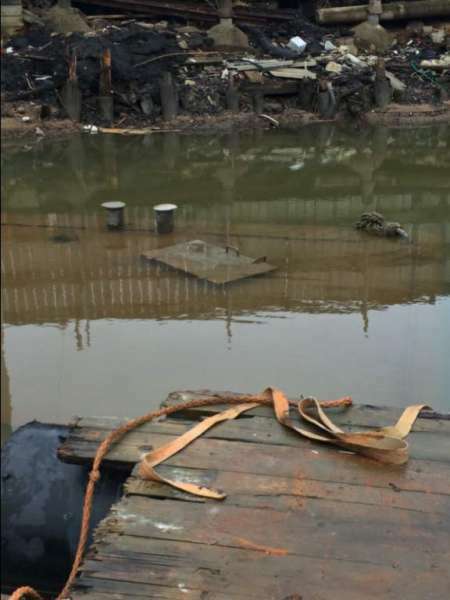 Destruction has taken place and the certificate of destruction has been issued. 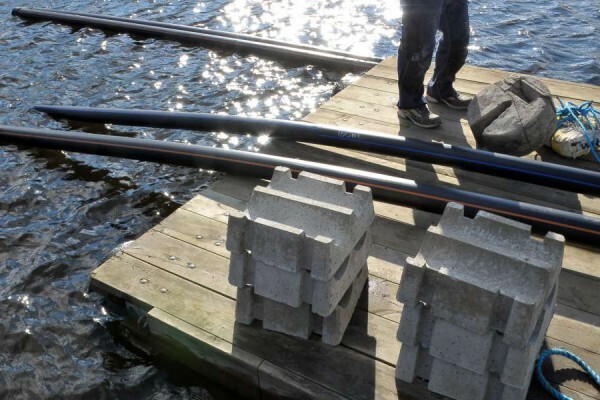 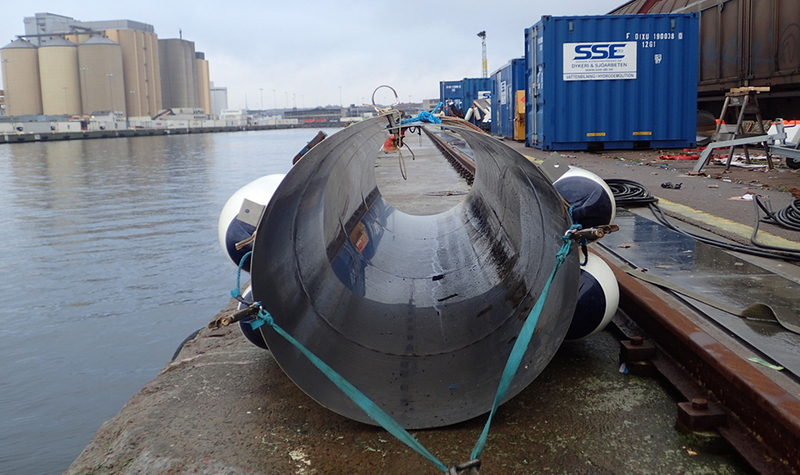 Karlskrona municipality are very pleased with the vessel removed. 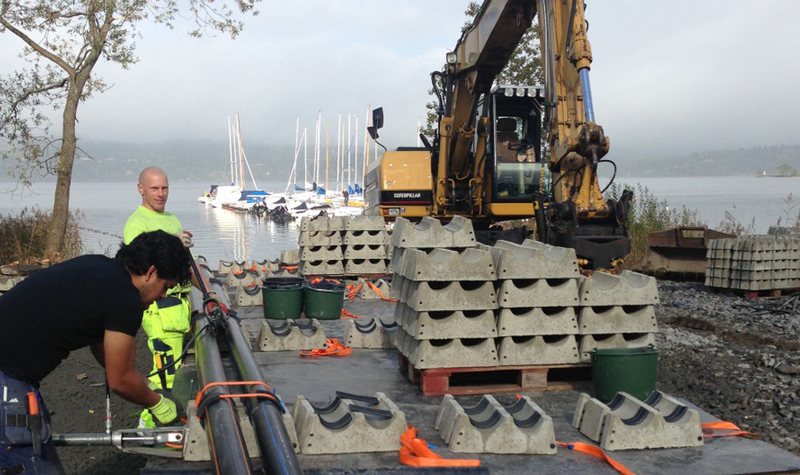 SSE has successfully conducted extensive sea pipework with excavation and installation of the pump station at the Skår–Simmenäs. 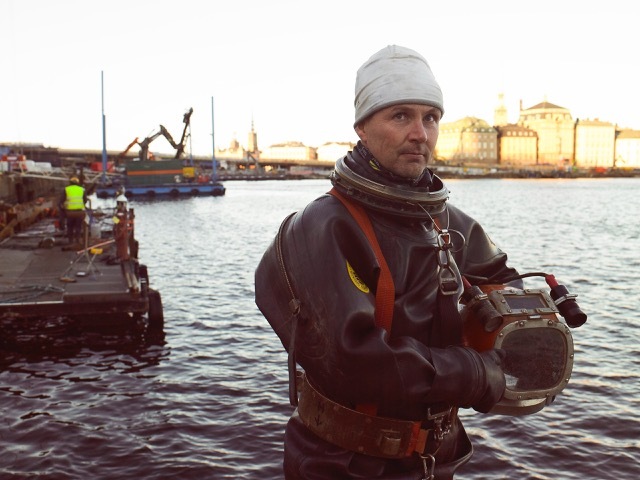 The workforce consisted of Dive Team, construction workers and an excavator. 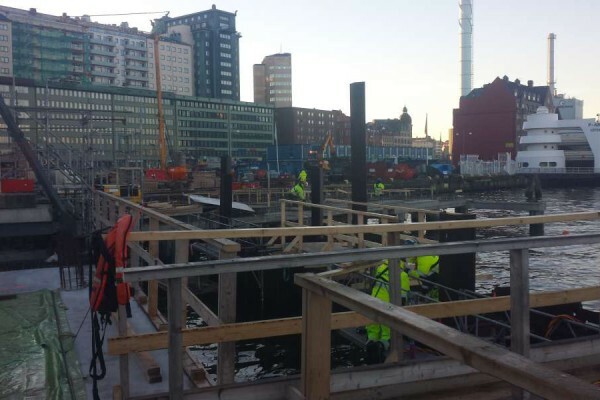 The project period was from September until December 2014. SSE has meritorious executed repair of 9 pieces piles and a greater number of pile joints and mounted ice-collet for continued long life. 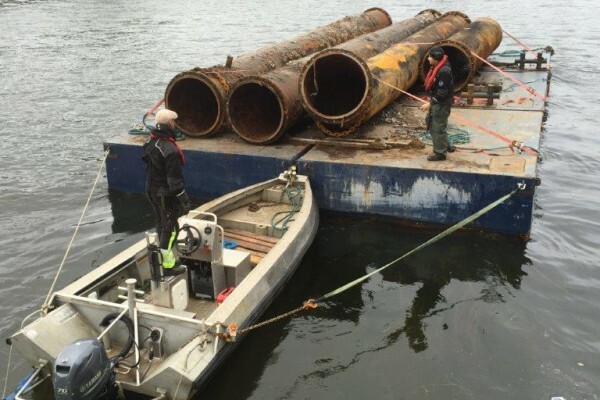 The workforce consisted of Dive Team 3 man and the project was spread over 3 months. 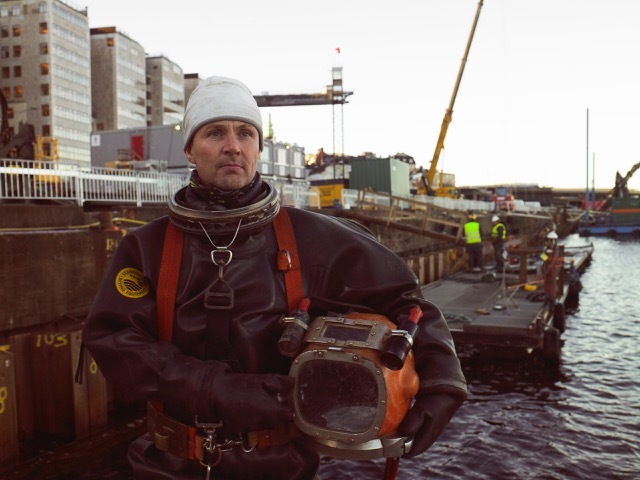 We have experienced and well trained personal. 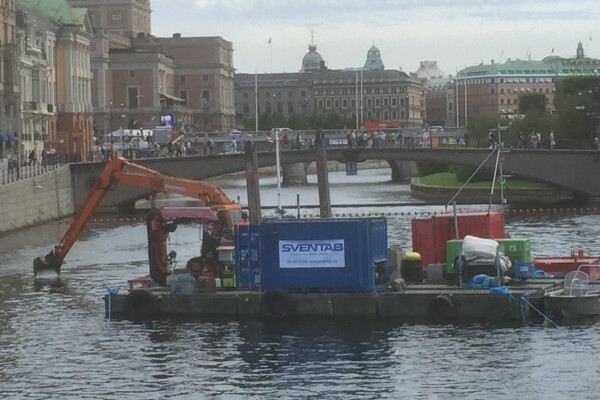 SVENTAB perform on behalf of JM extensive renovation and topping of the existing quay during Lilje Holm bridge in Stockholm. 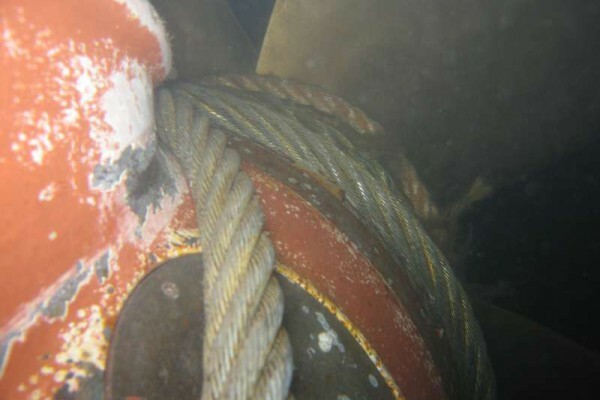 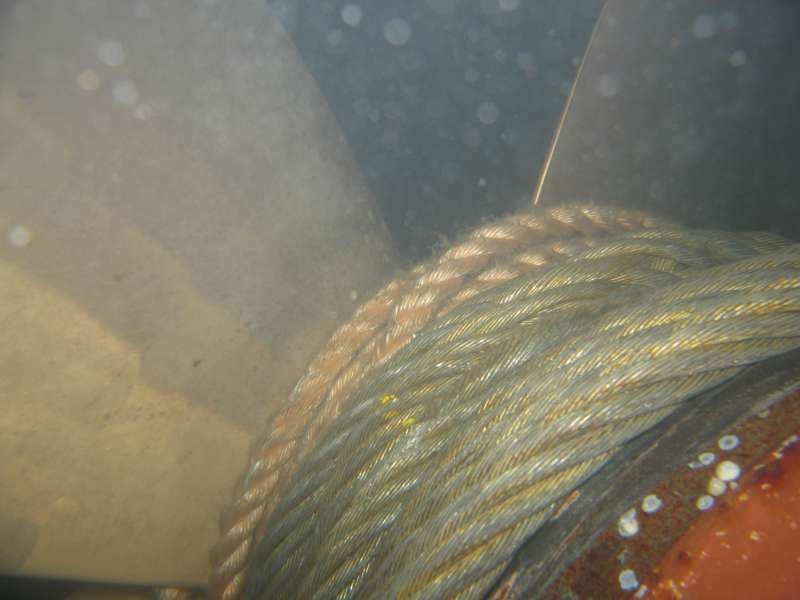 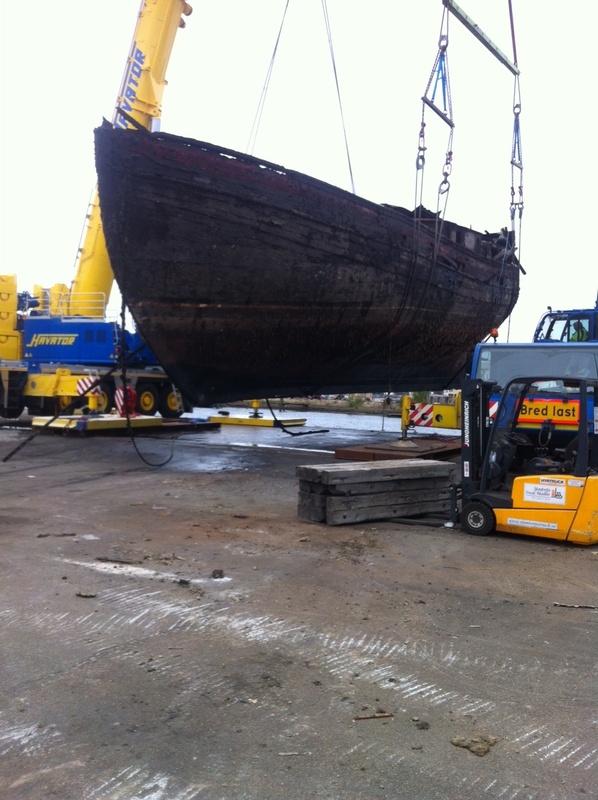 SSE has successfully conducted extensive repair of caisson after collision damage. 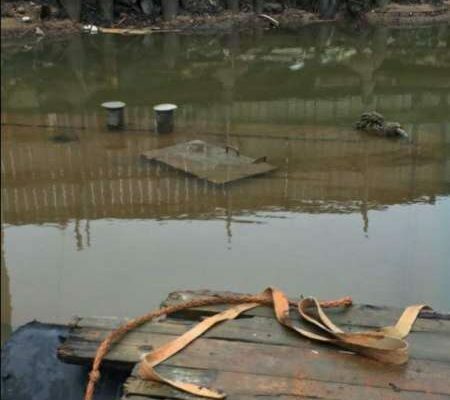 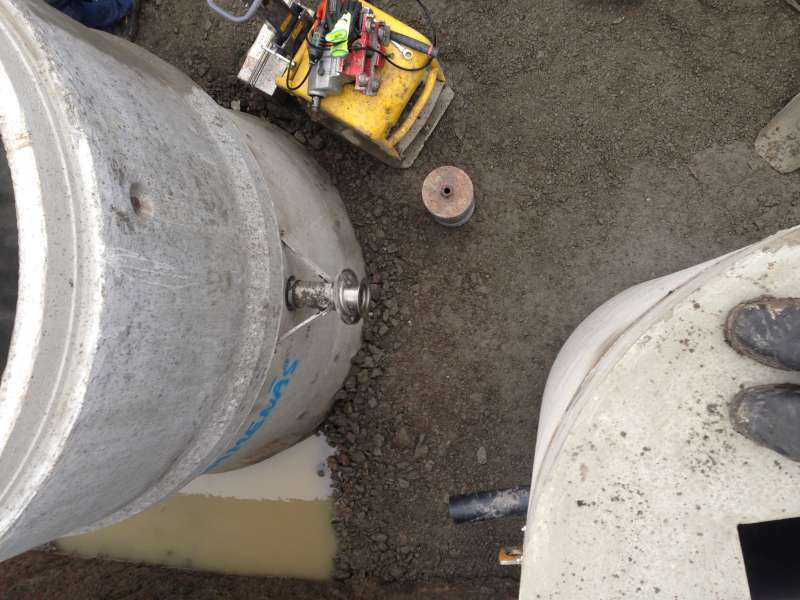 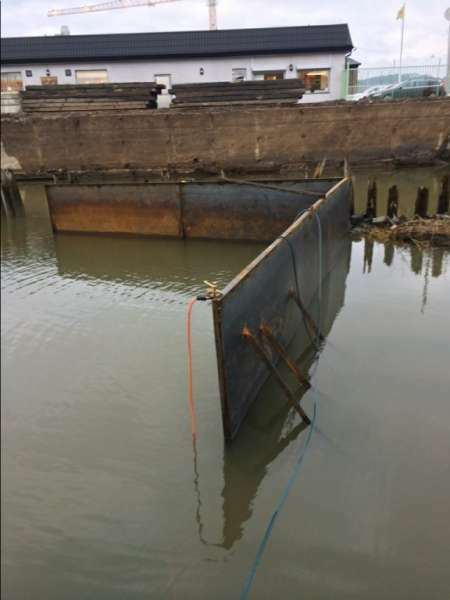 We have water roughly squared away the damaged part, built new molds and shed new caisson in several stages. 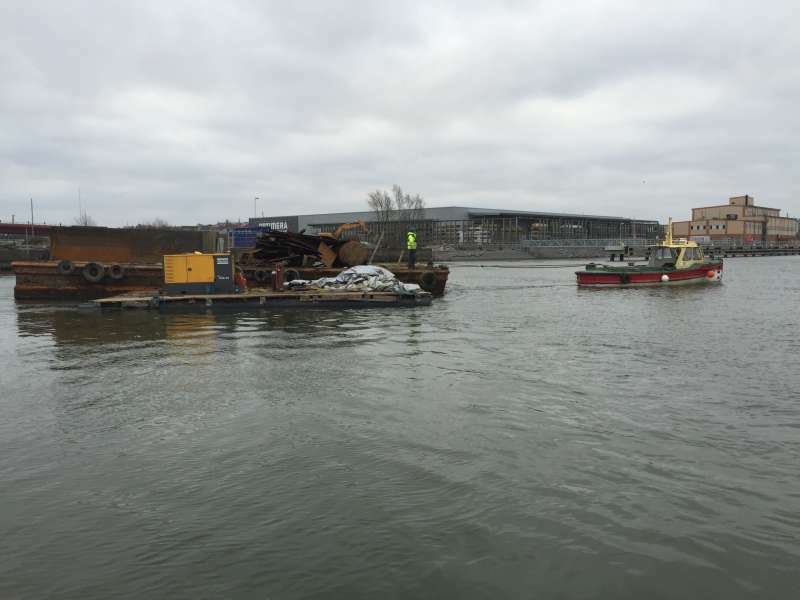 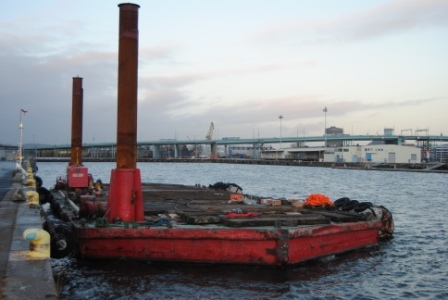 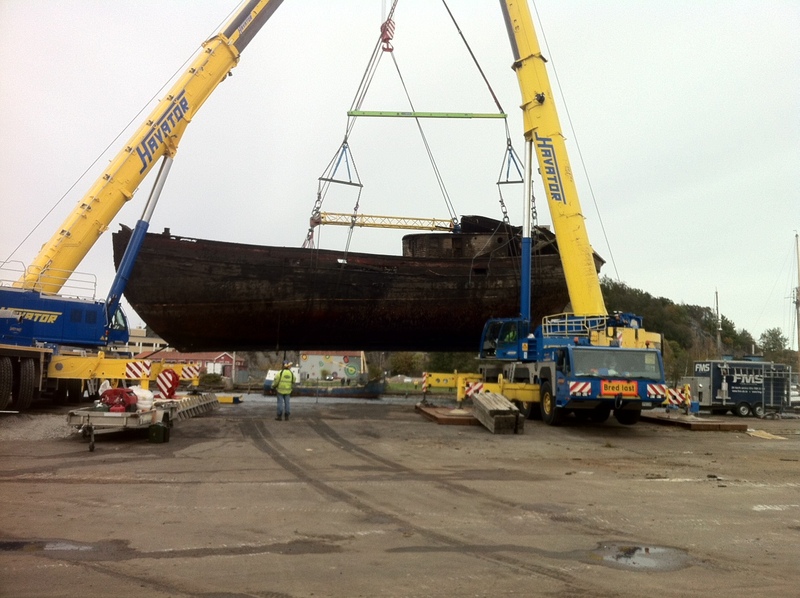 FMS on behalf of Boskalis and The Swedish Transport Administration salvaged two barges from the bottom at Marieholms in Gothenburg. 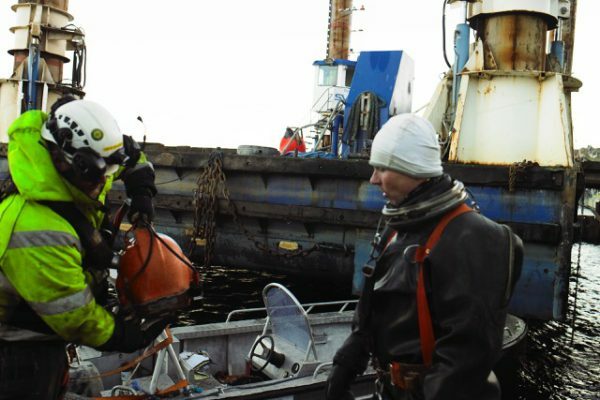 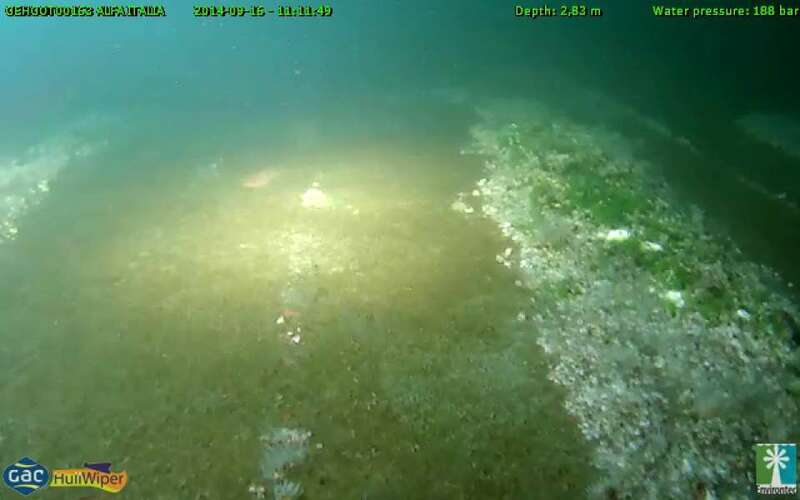 The work has been carried out for 6 weeks in January-February 2015 with a Dive Team from Händig and piperaft with work boat Aluett and Uttern. 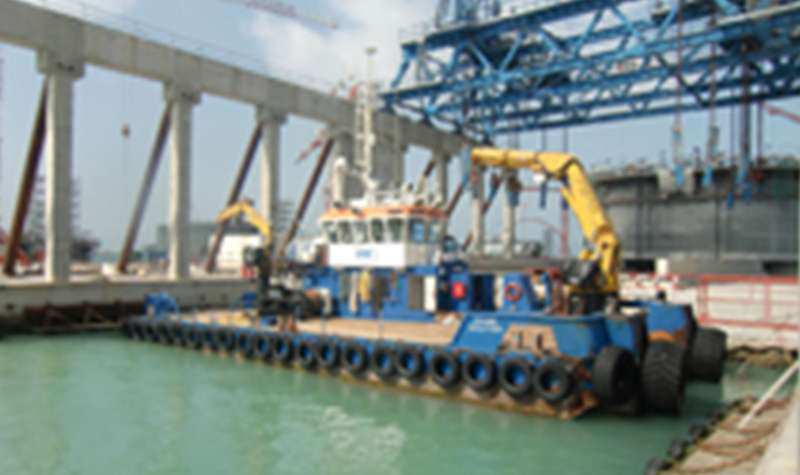 Two of SSE Construction Vessel have worked in Morocco. 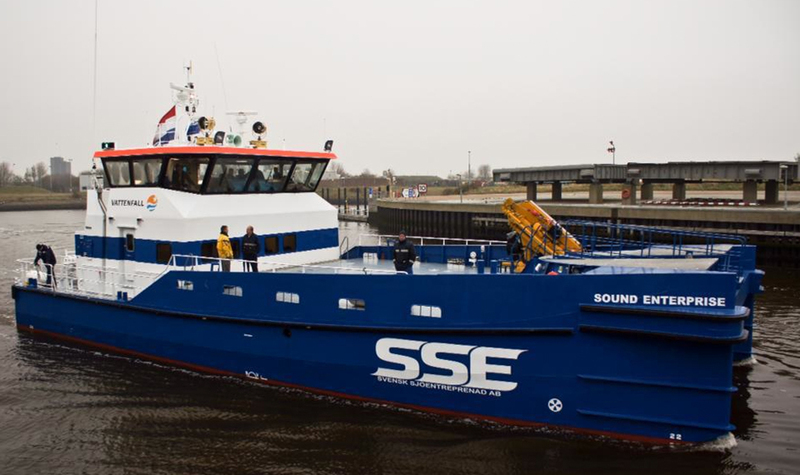 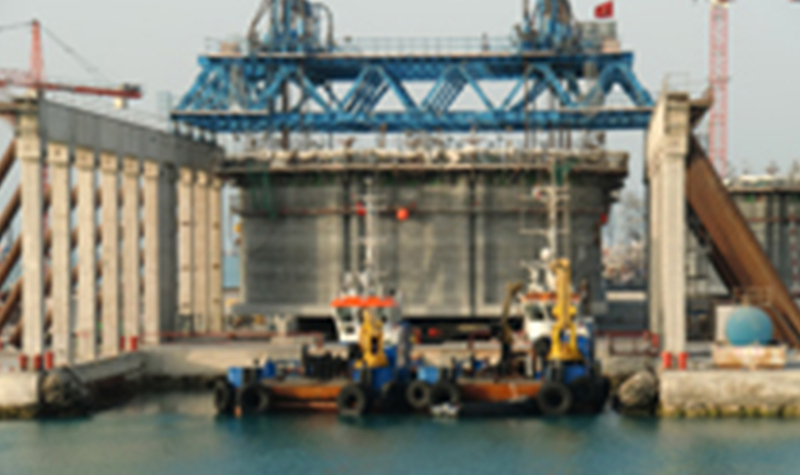 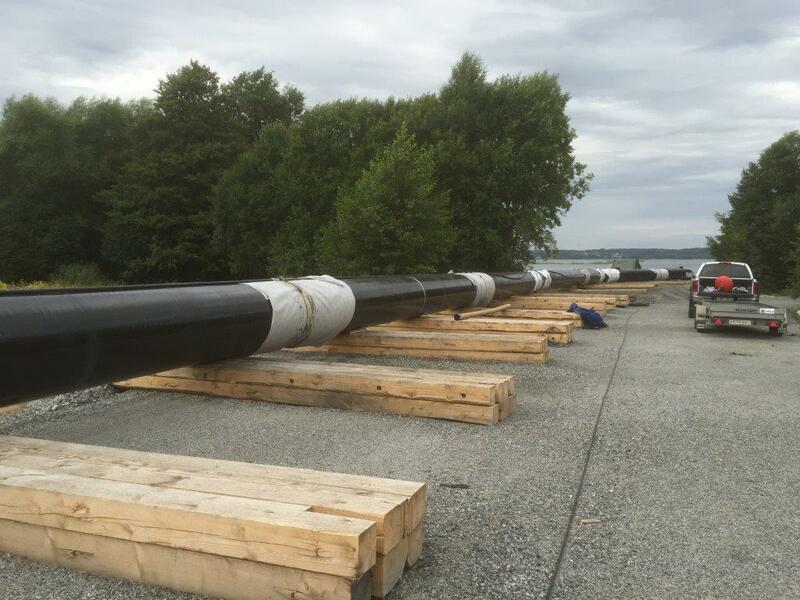 Sound Solution and Sound Horizon has positioned and towed caissons and barges. 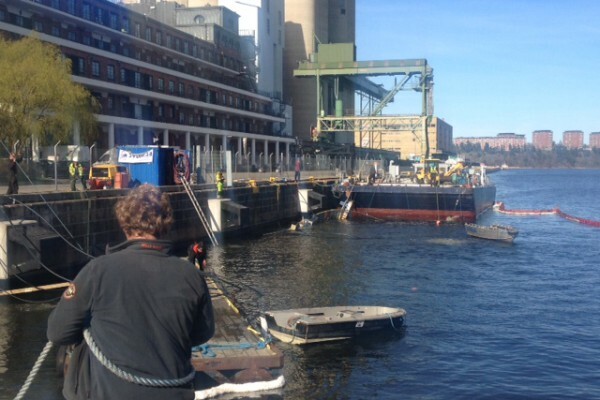 SSE has renovated and improved the quays to Fortifikationsverket. 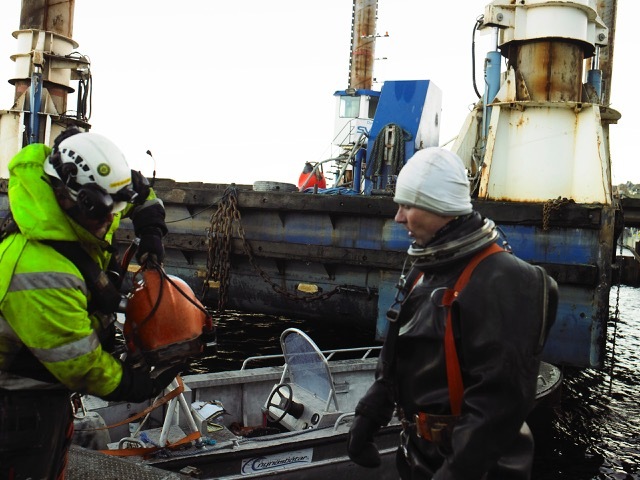 The resource has been working vessels Frida and Filip with Dive Team. 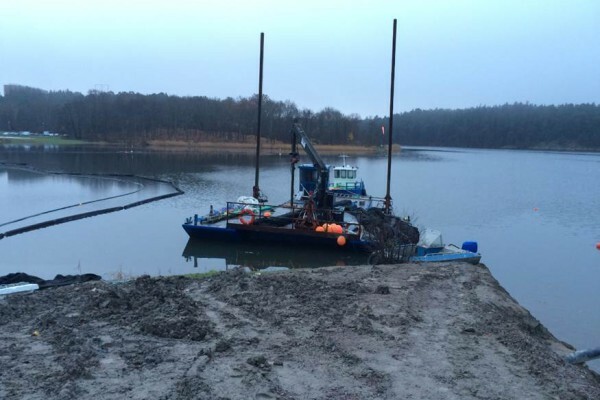 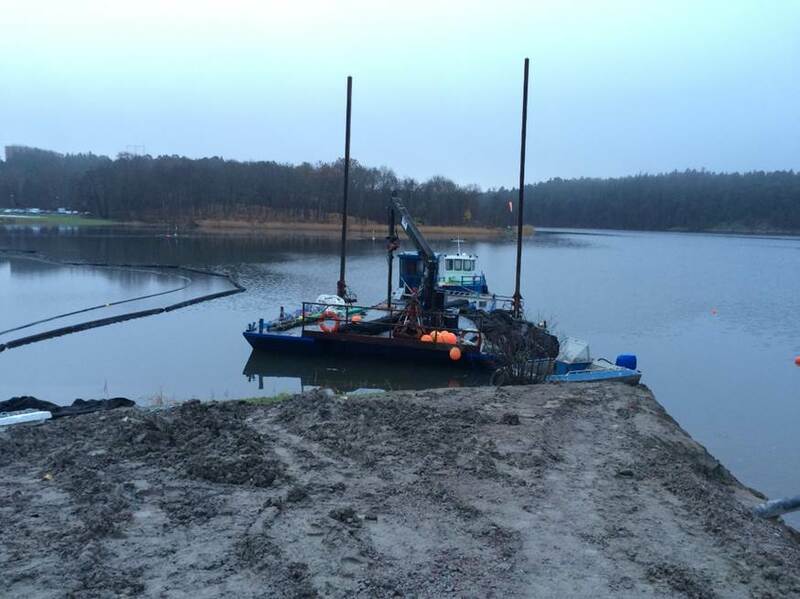 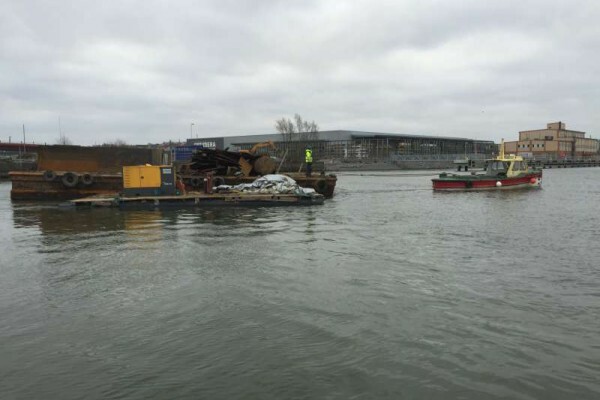 Our new dredging department has implemented many dredging projects during 2014. 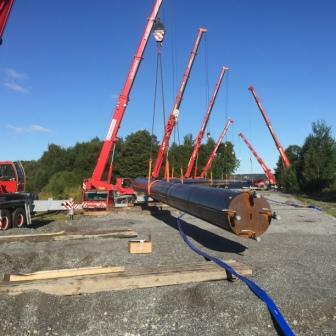 SSE has performed the transport of service technicians at Lillgrund wind farm park for Vattenfall AB. 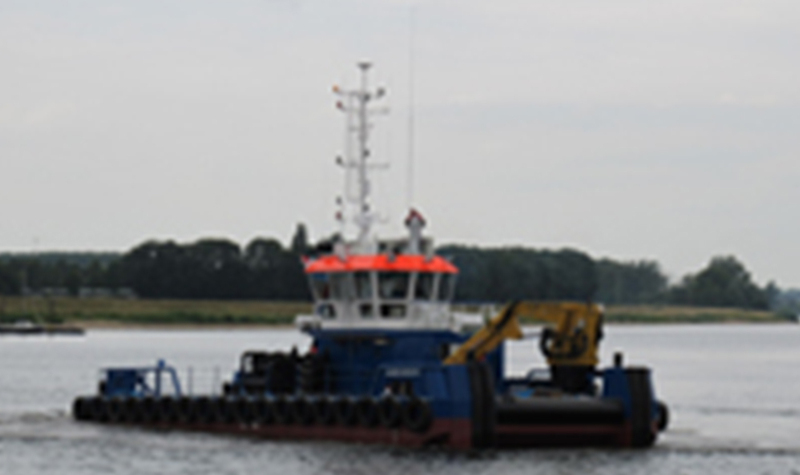 The resource has been service vessel Sound Enterprise. 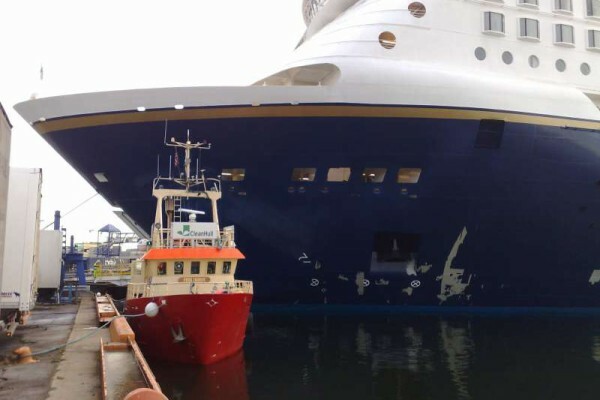 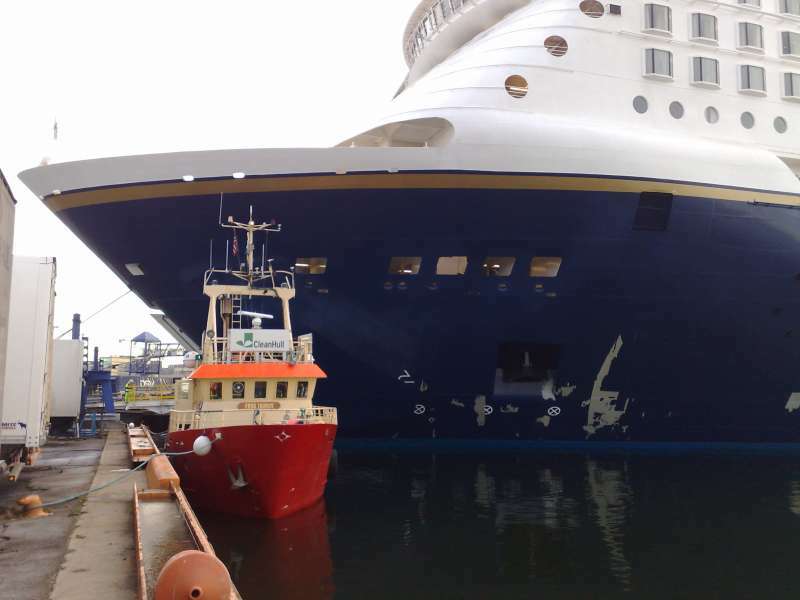 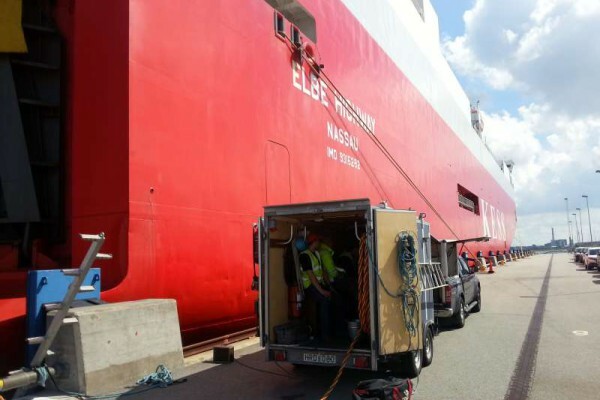 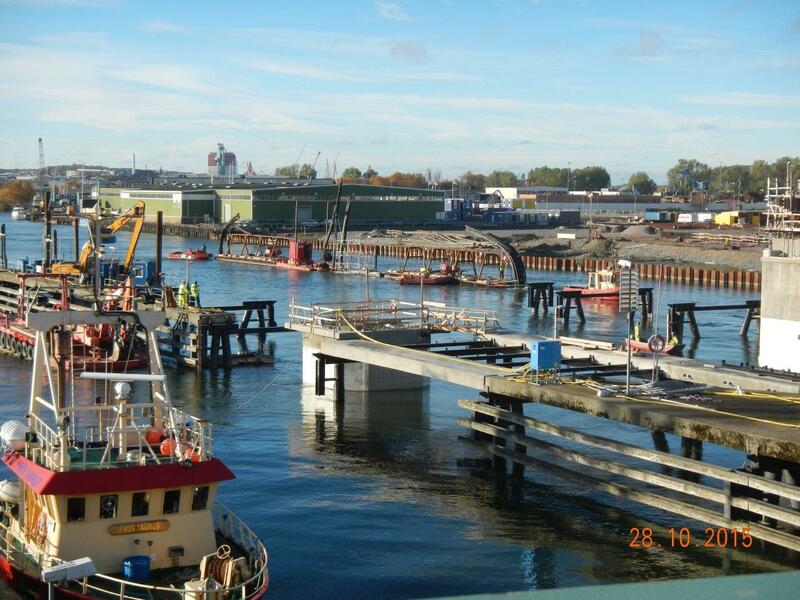 SSE has performed repair of caisson for collision damage to the port of Helsingborg . 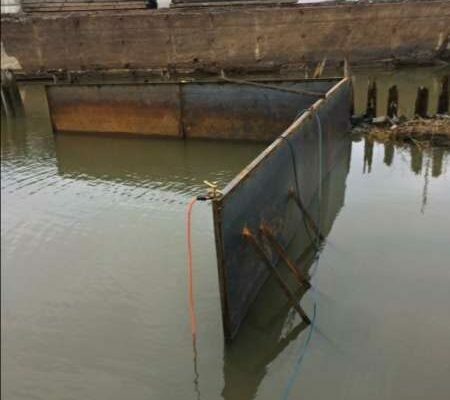 We have water roughly squared away the damaged part , built new molds and shed new caisson in several stages. 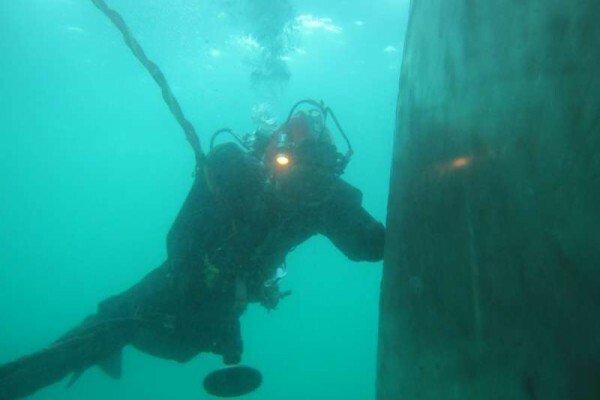 The workforce consisted of Dive Team 3 men and the project period was 7 weeks. 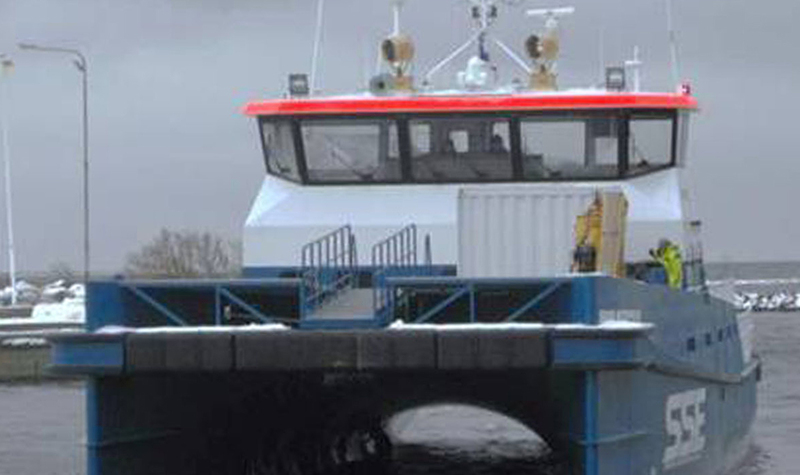 SSE is a subcontractor for Skanska Sweden AB for the construction of new ferryport , FL10 . 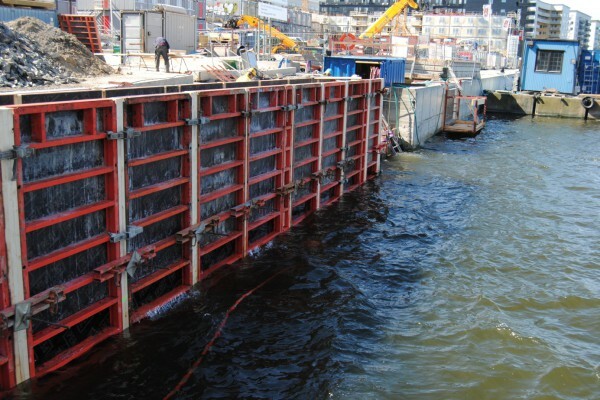 110st link plates A 11 tons, the casting of approximately 4000m2 erosion control , construction of 11st bottom boxes for fender foundation. 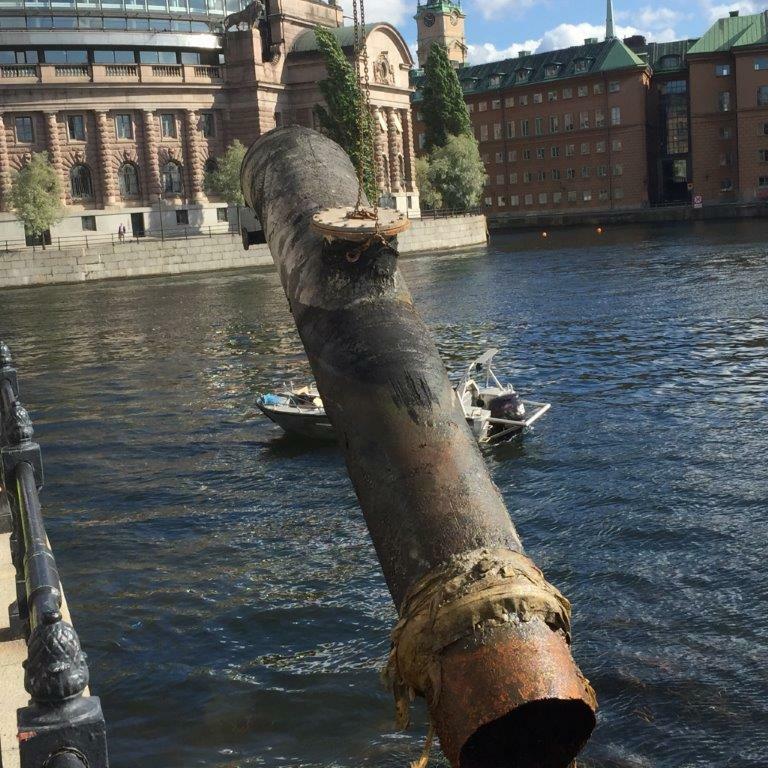 Sjögrip incl. 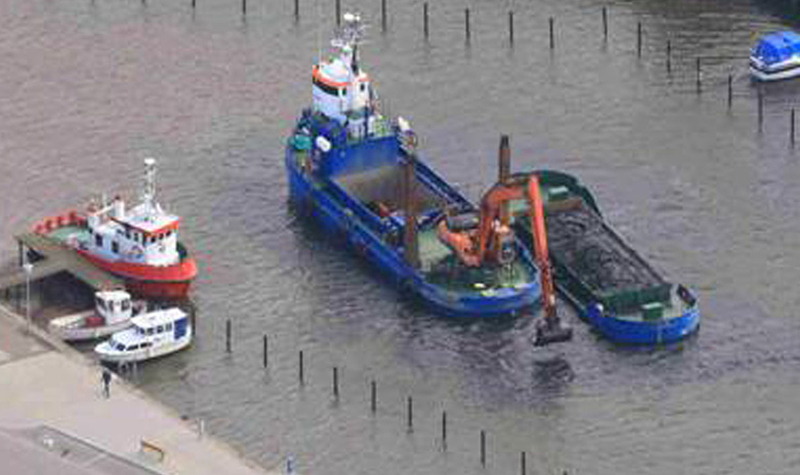 Tugboat , barges and excavator. 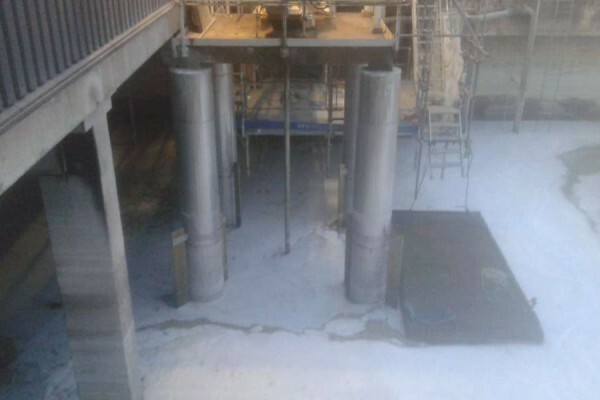 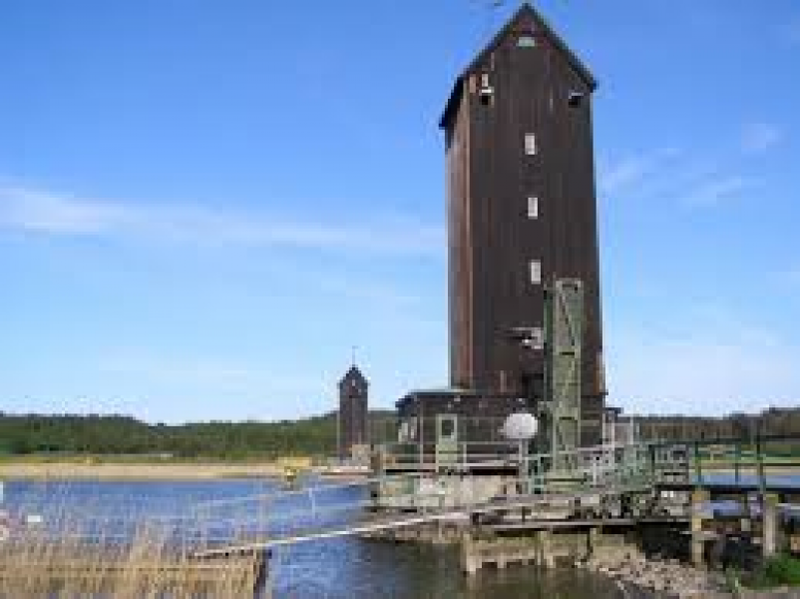 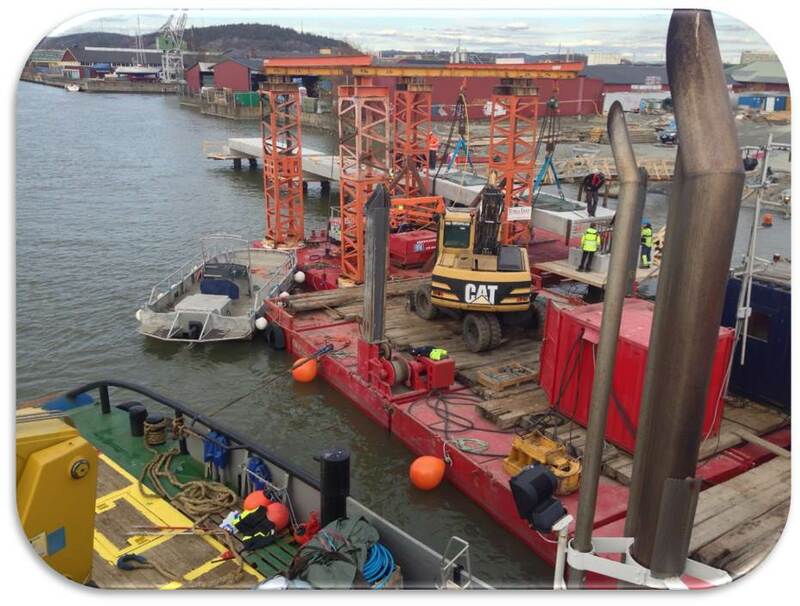 FMS have successfully performed seapipe 3120 m x 2, TS125PE, and performed pumpstation at Alingsås town. 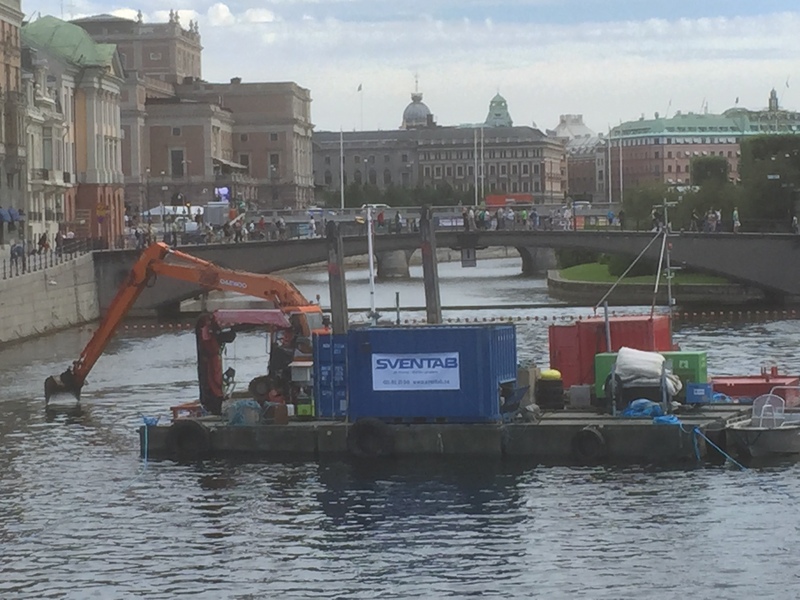 SVENTAB perform on behalf of JM a bulldozer, leveling the ground, reinforcement and dense casting of several contiguous groove pits KVV8, Stockholm. 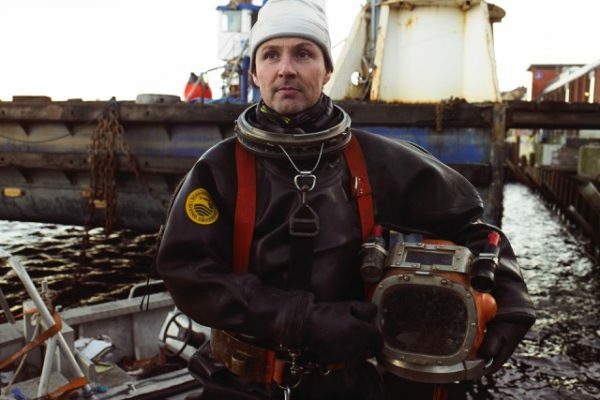 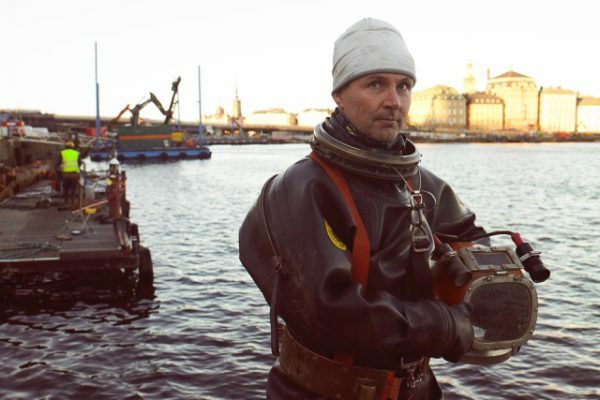 The workforce consisted of several Dive Team who worked in shifts / 7 days a week. 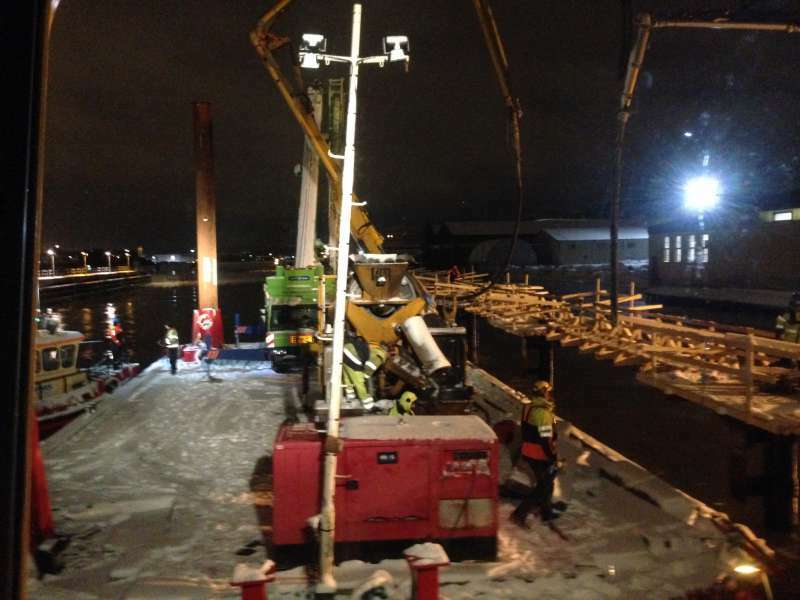 0500-2200 during the summer 2014. 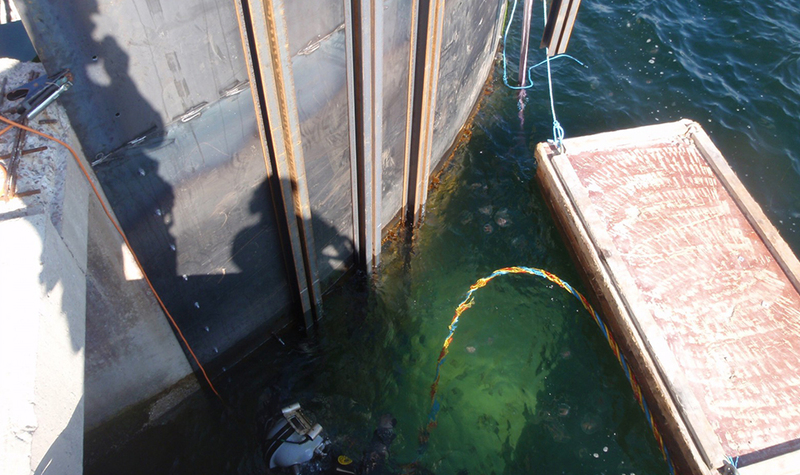 We have Toyoexcavated, rinsed steel sheet pile, leveled the ground, armored ink UV casting. 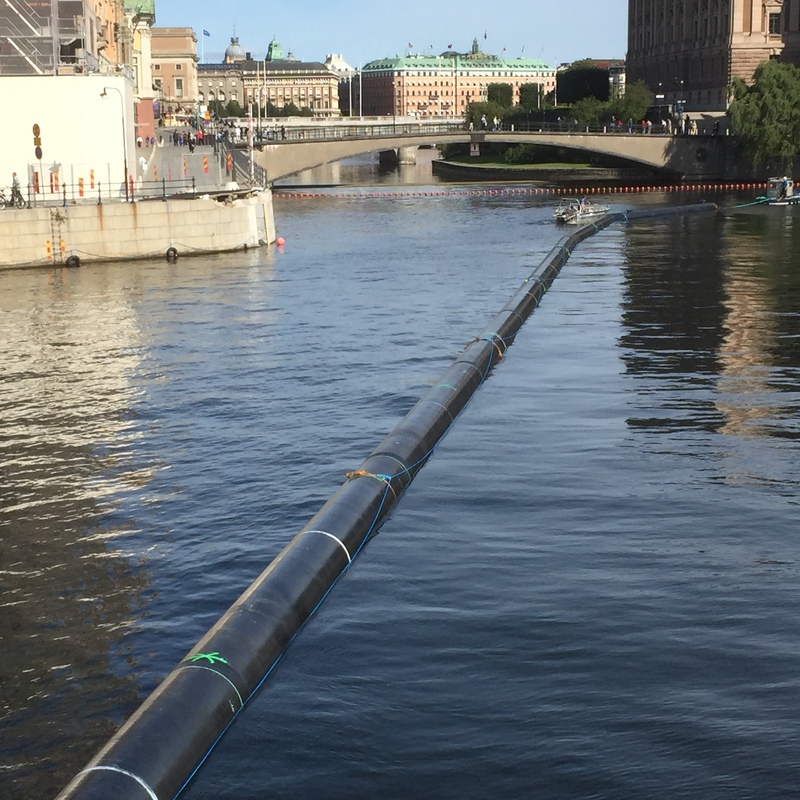 MarCon Group has acquired Stockholm Water Entreprenader AB. 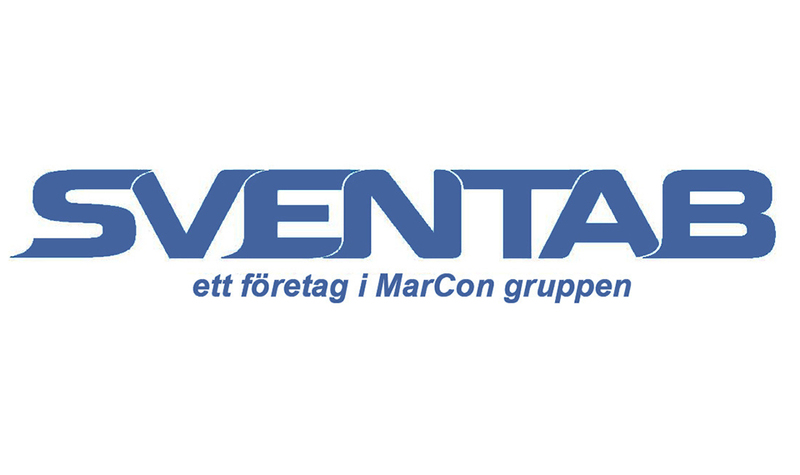 SVENTAB engaged in a similar business as MarconGruppen preferably in Stockholm / Mälardalen. 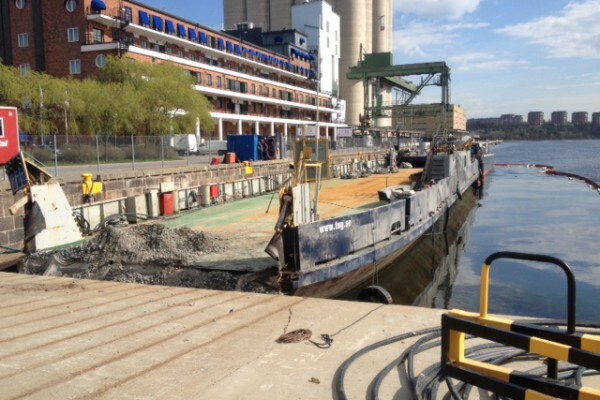 working from the ship M / S Frida and mudderfartyget M / S Sjögrip with barges. Several tons including scrap and over 250 m3 of wood is lifted from the ocean floor . 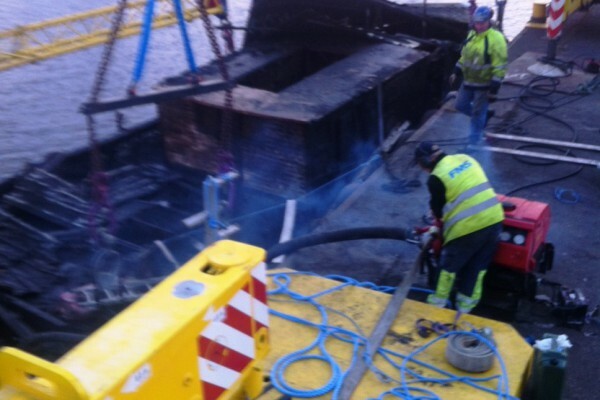 SSE has worked with the replacement of lead weights for Skanska in the south-west link. 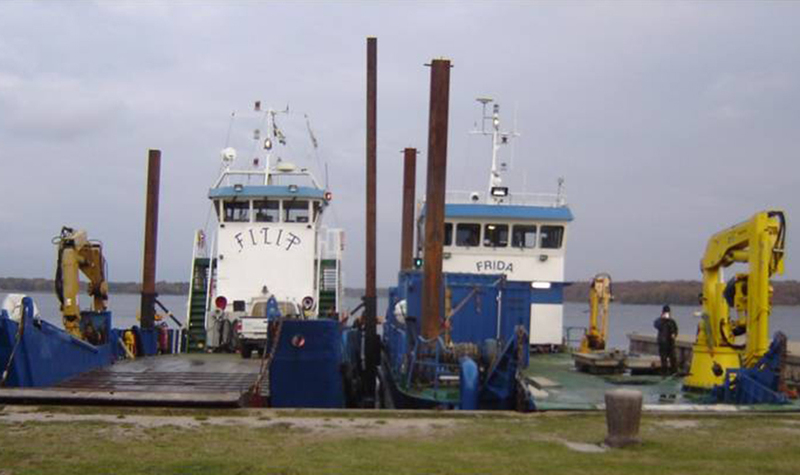 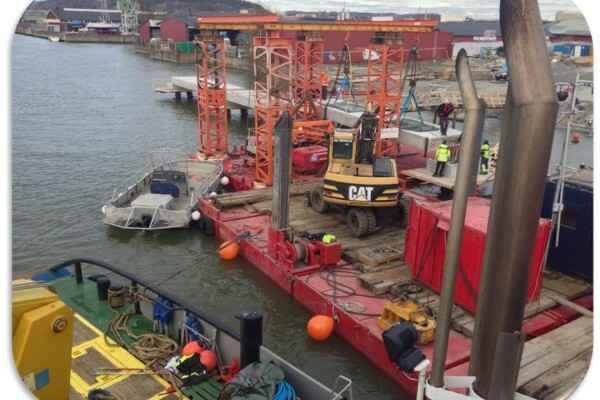 Our equipment has been the raft Pontus by crane and workboats . 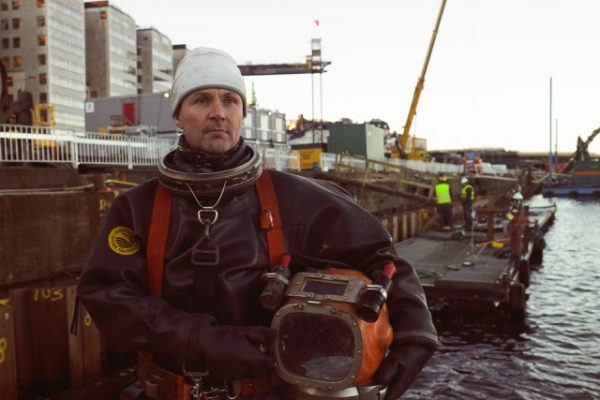 The workforce consisted of Dive Team 4 men and the project period was five weeks. 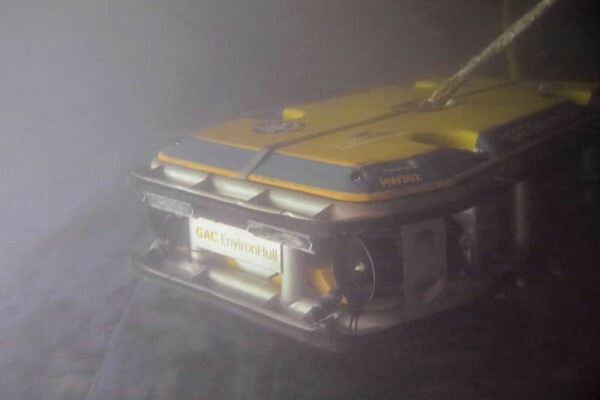 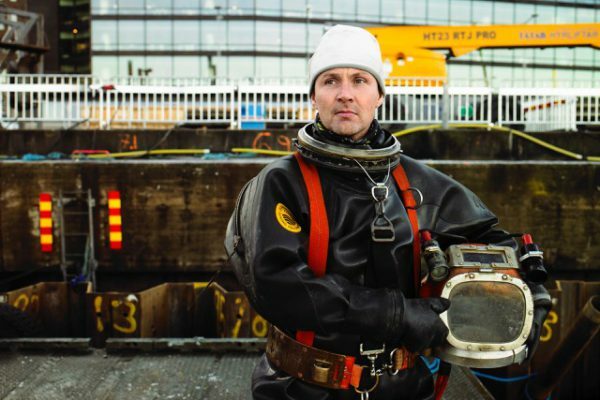 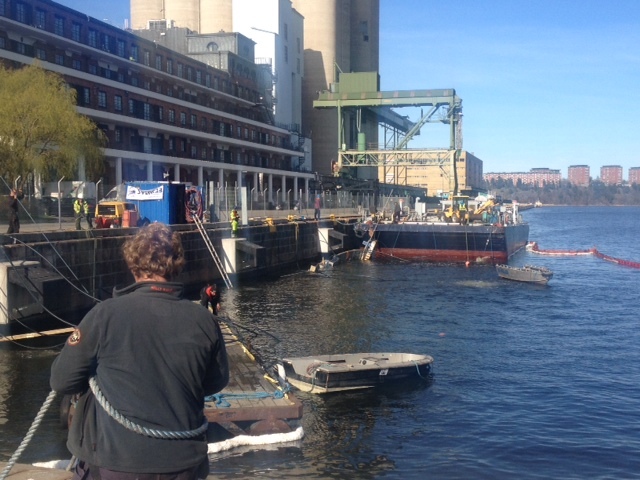 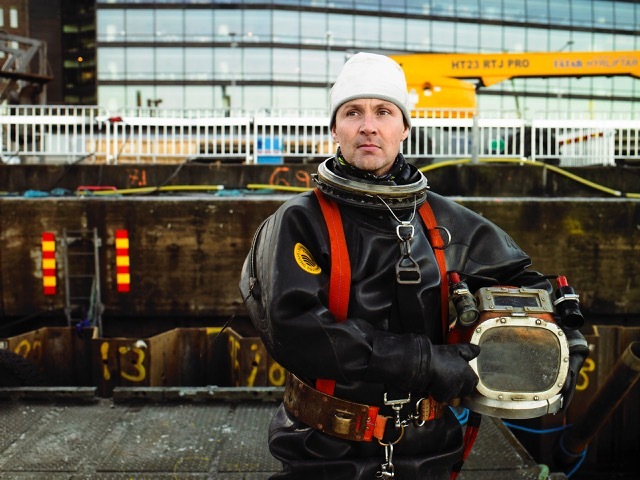 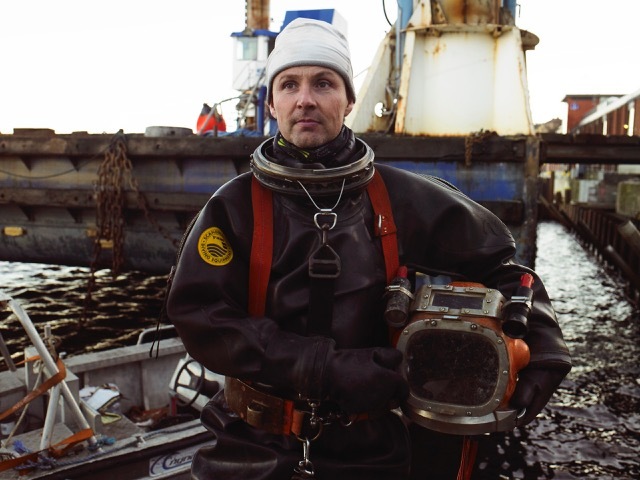 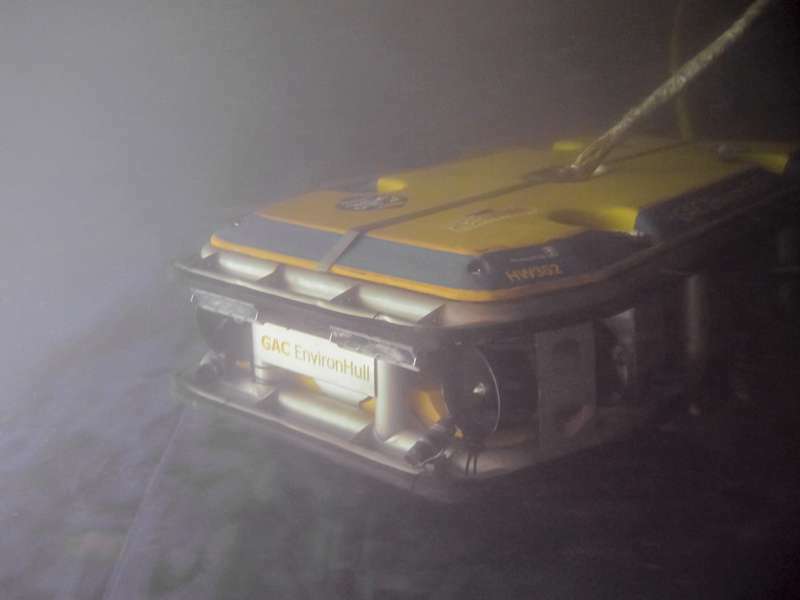 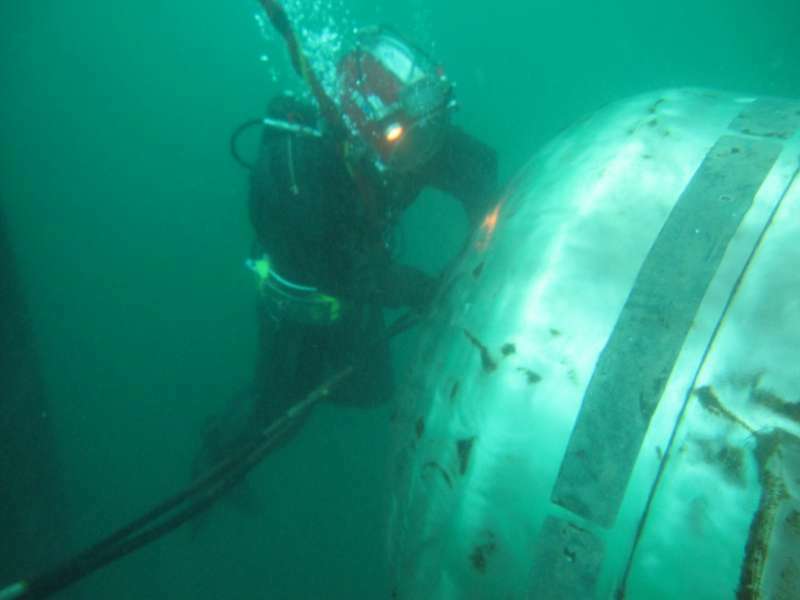 SVENTAB perform along Marine & Accident AB a salvage mission in Stockholmshamnars Freeport pool. The workforce in the water consisted of one to two Dive Team who have sealed all the hull / deck penetrations mostly from the inside. 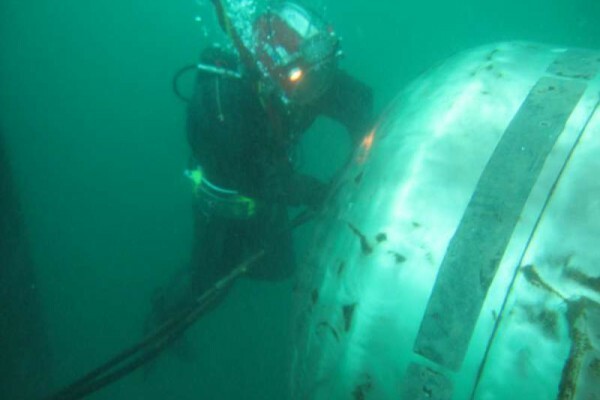 Then were pressurized hull with air rescue method. 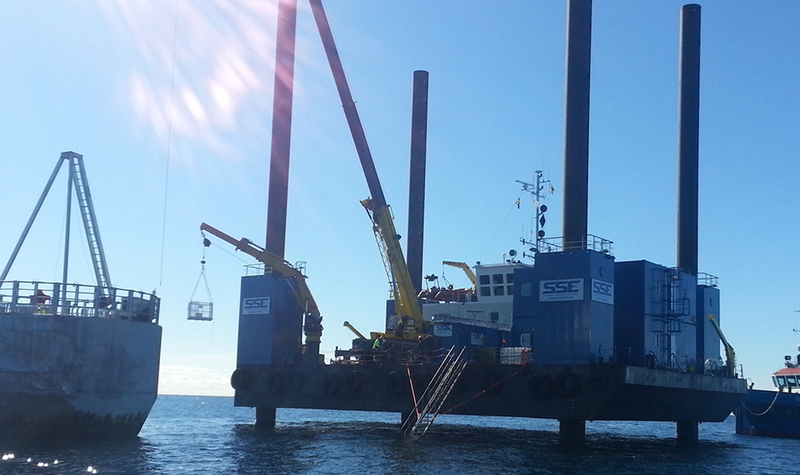 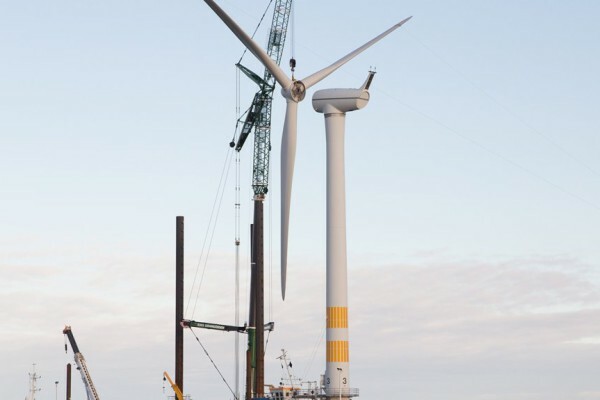 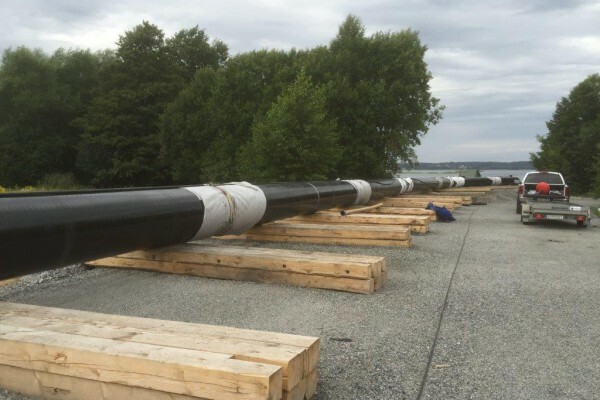 SSE has together with Baltic Offshore successfully worked on a wind farm project about 16 wind turbines and two export cables about 5 km east of the Kårehamn in eastern Öland. 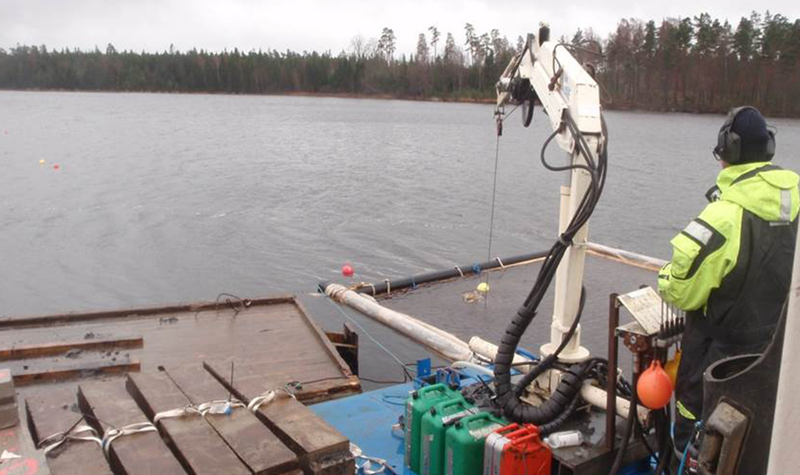 The work has been conducted with Dive Team, Jack-up Sound Prospector and workboat Sound Provider. 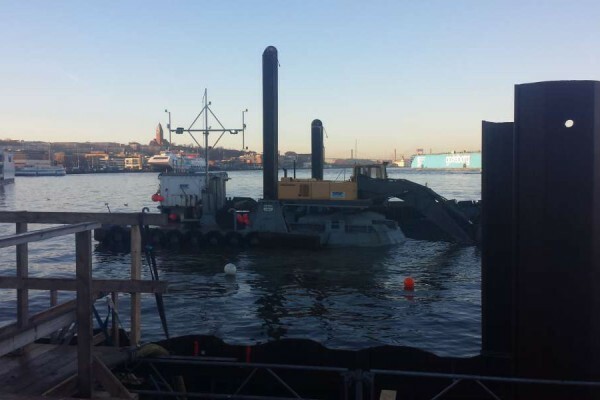 excavator on Sjögrip and tugboat Sound Castor with barges. 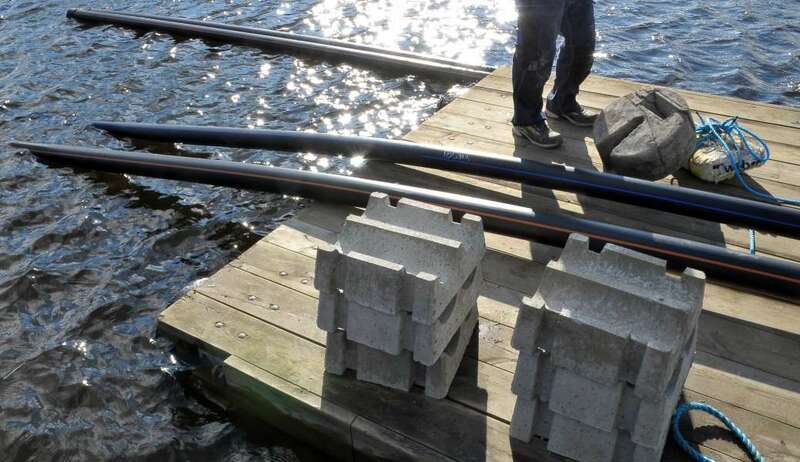 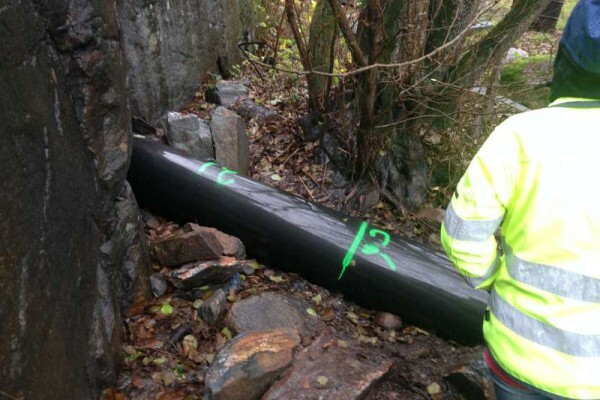 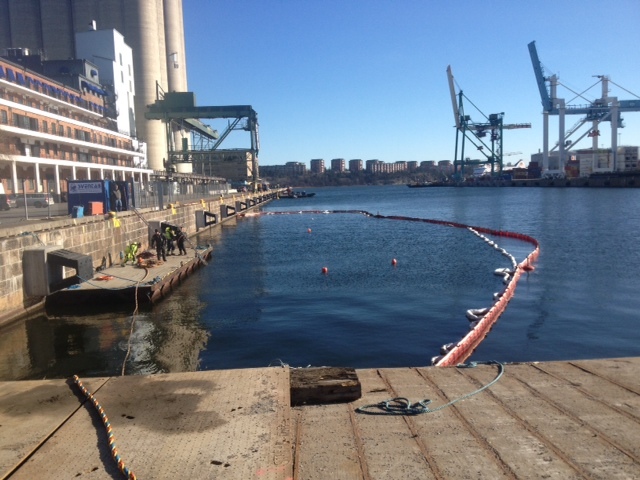 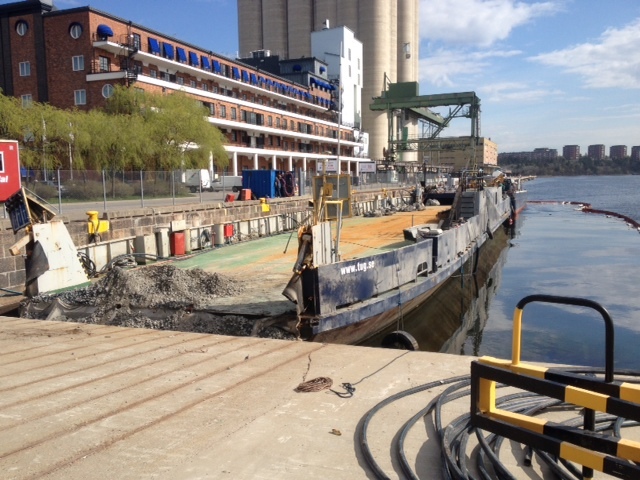 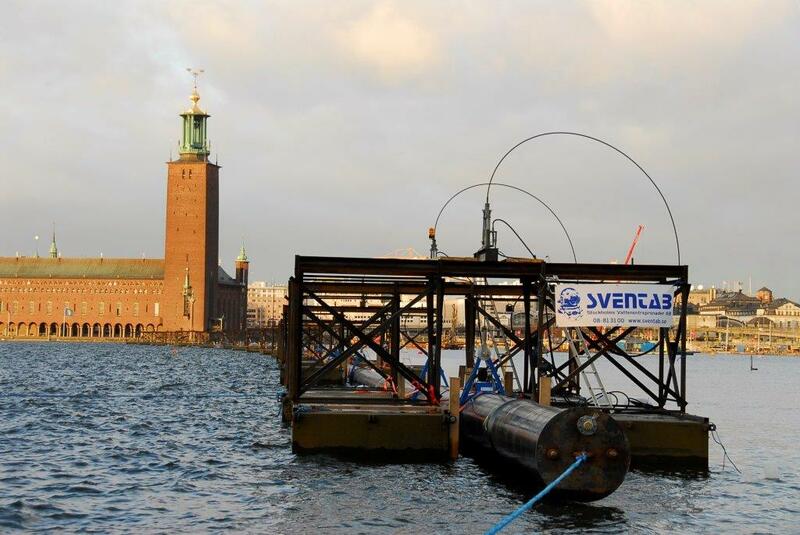 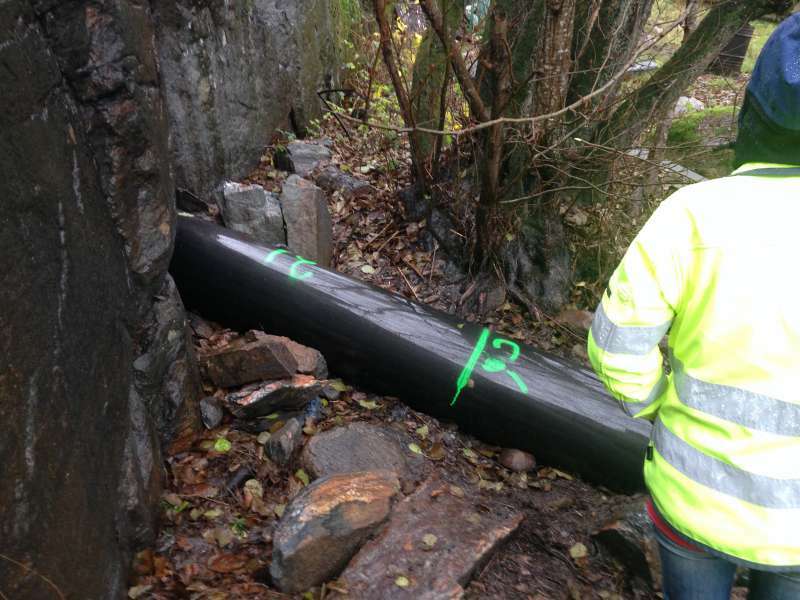 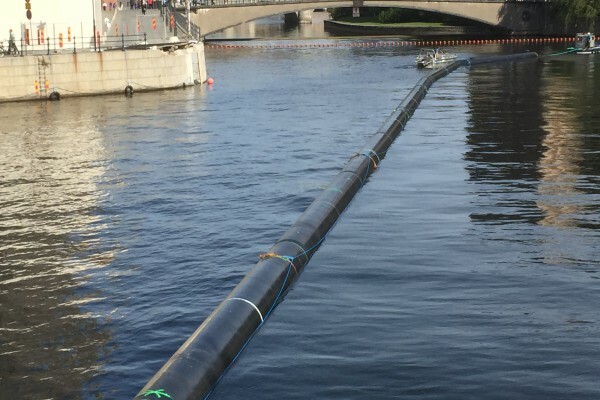 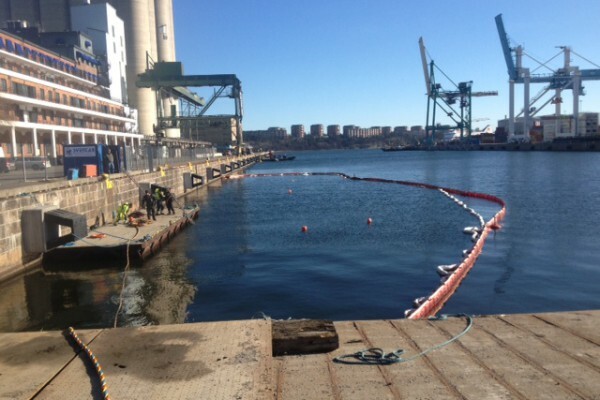 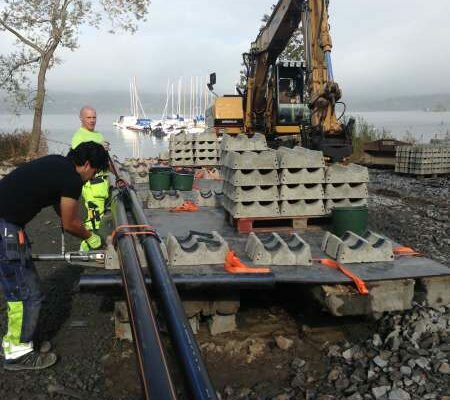 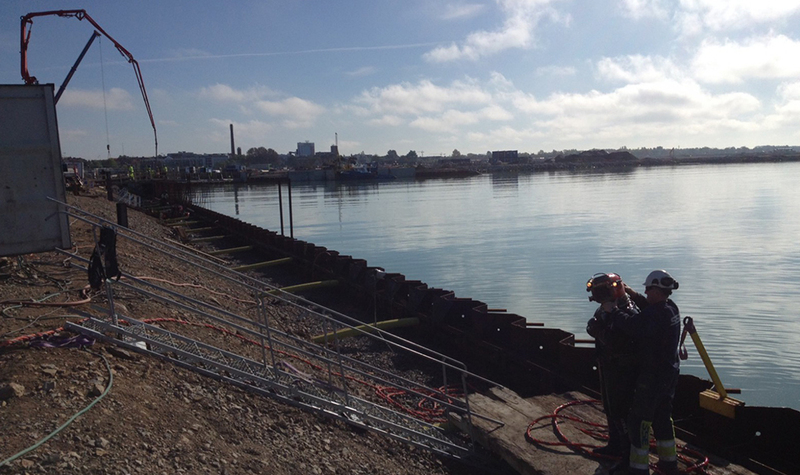 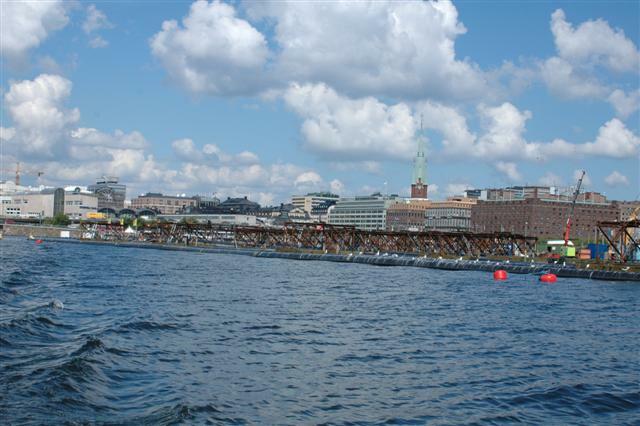 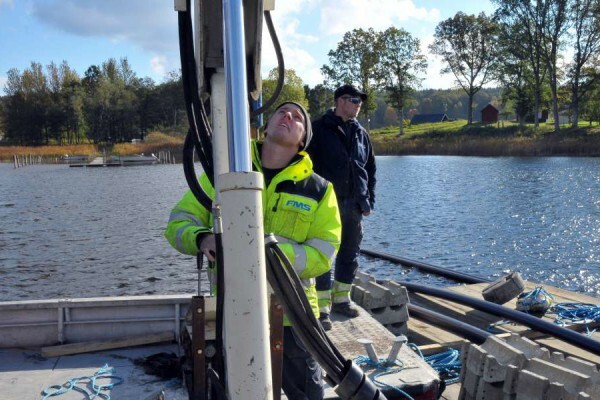 SVENTAB perform the task for Fortum and Stockholm Water installation of new heating and water of Riddarfjärden. 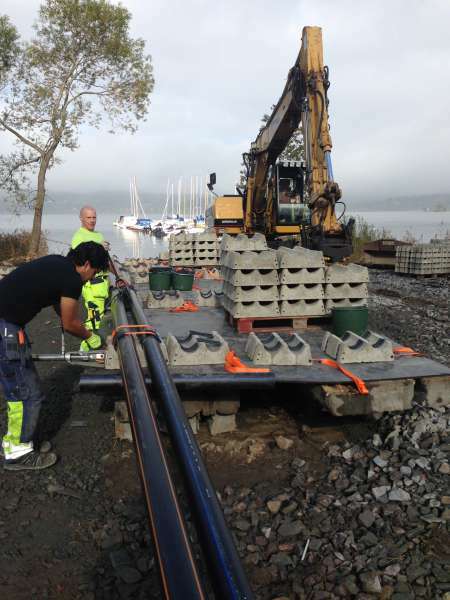 District heating line 2 x 1500m. 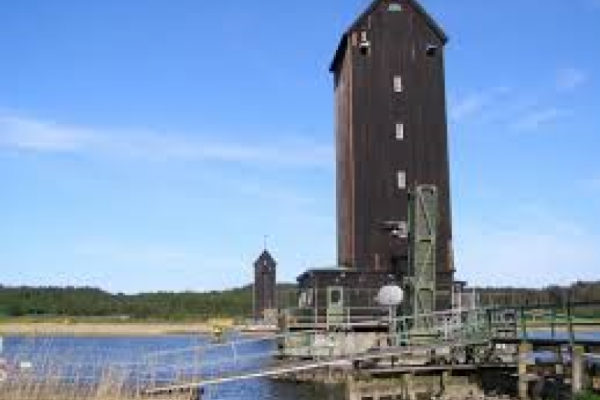 Stål Dim 800mm. 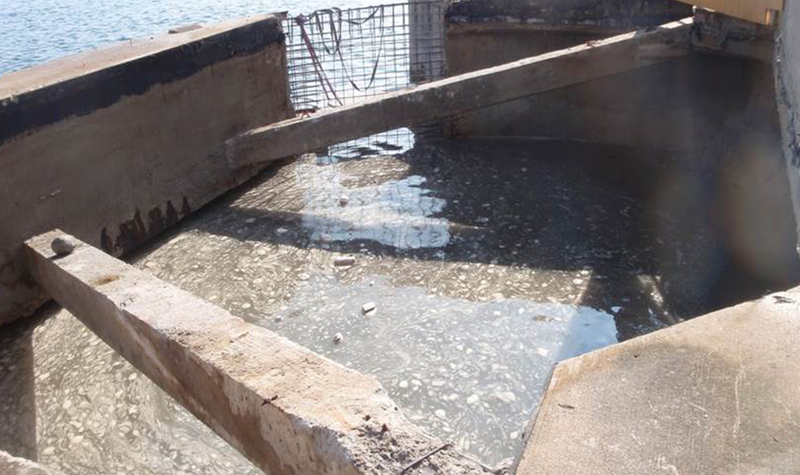 Water supply 1500m. 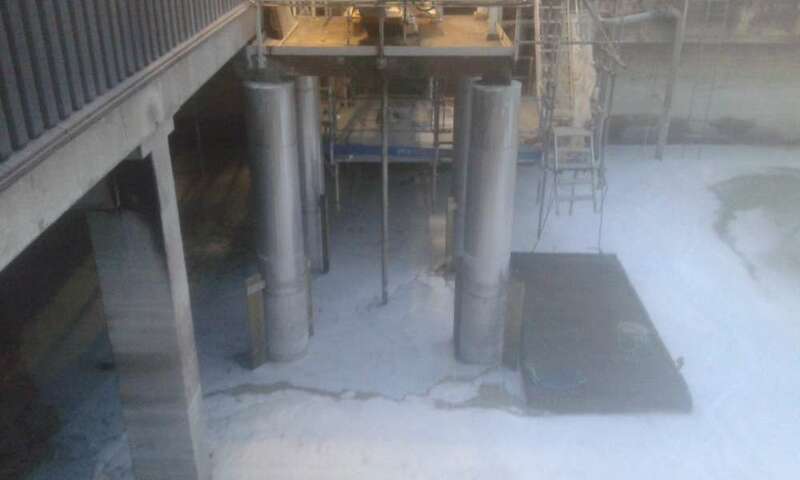 Steel Dim 900mm. 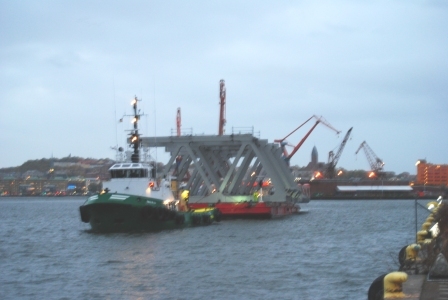 in Klagshamn and transport service engineers and spare parts to Vattenfall’s Offshore Windfarm site Lillgrund. The new vessel will be in time charter for Vattenfall. 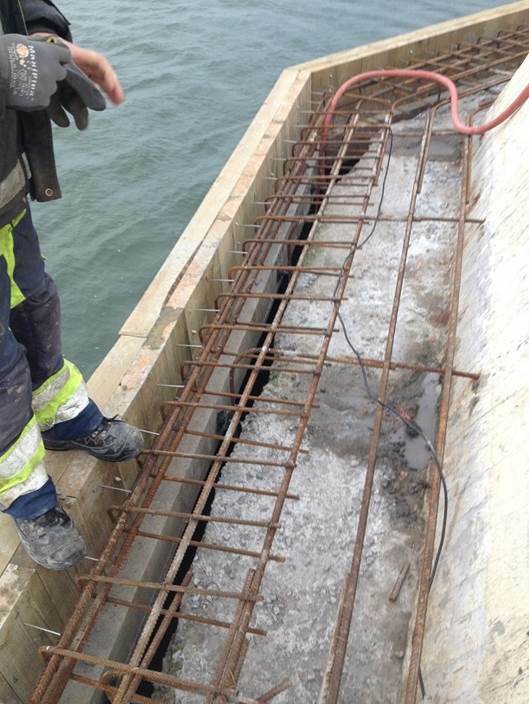 Construction of a new lead lighthouse on the east breakwater at Kemira Kemi in Helsingborg has started. 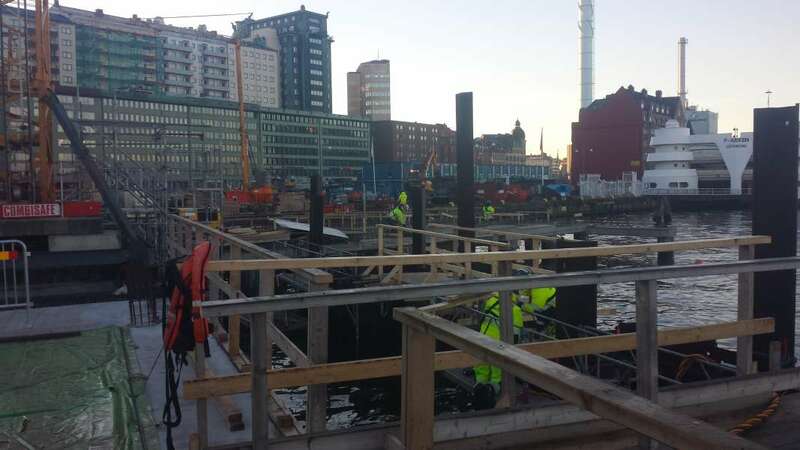 Here they are pouring concrete to construct the base for the lighthouse itself. 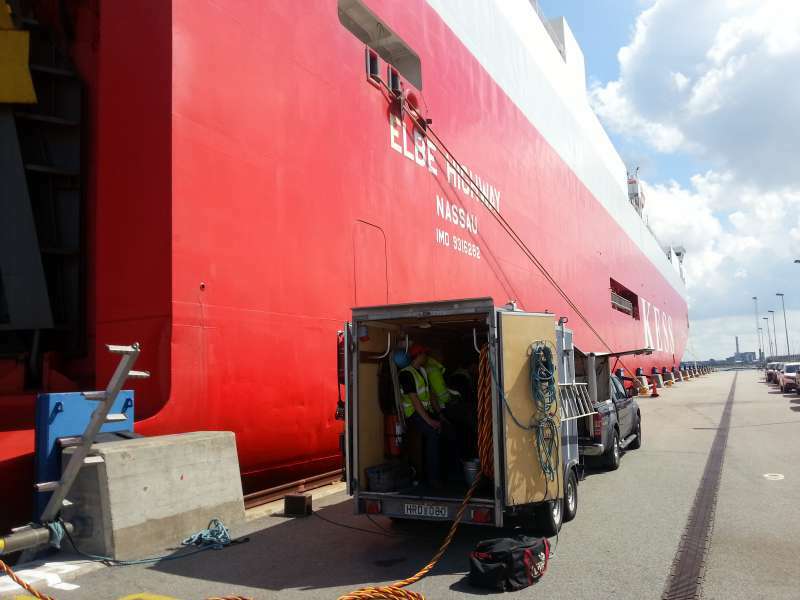 Done by SSE’s own Sjögrip. 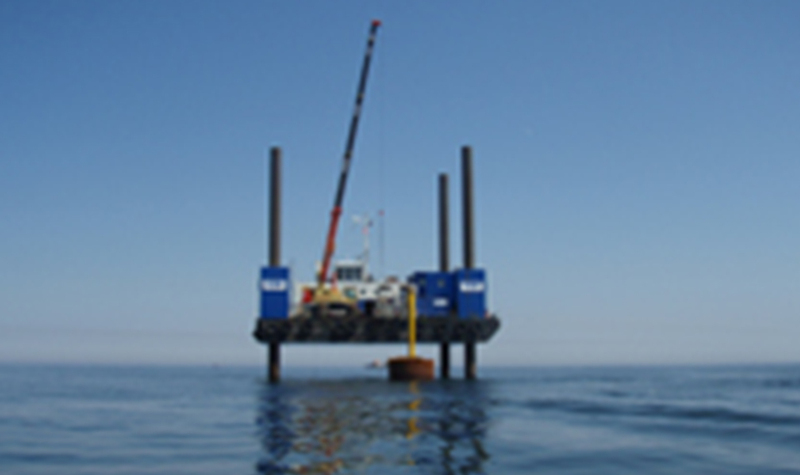 The project at Lincs Offshore Windfarm site is finished. 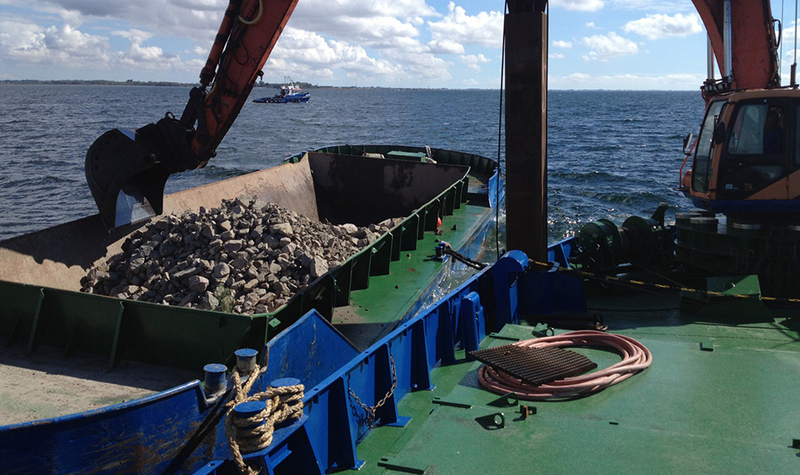 Sound Provider and Sound Prospector are now on their way back to Sweden. Sound Horizon joins Sound Solution in Tanger Med 2, Morocco. 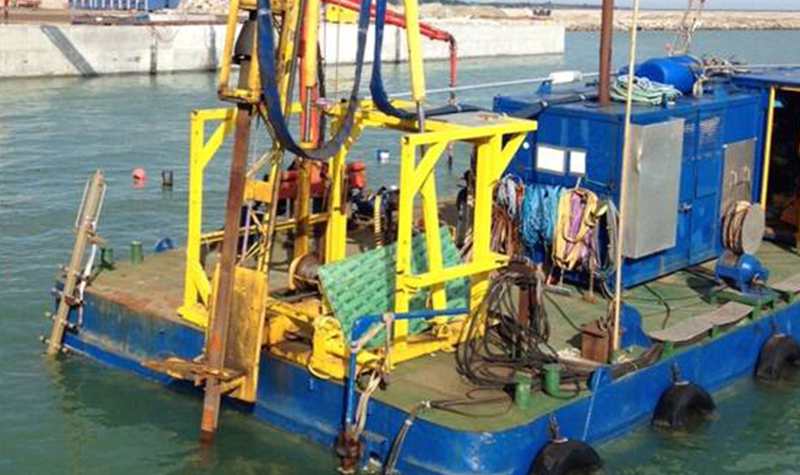 Sound Solution start to work in Morocco on a project to build a new harbour off Tanger. 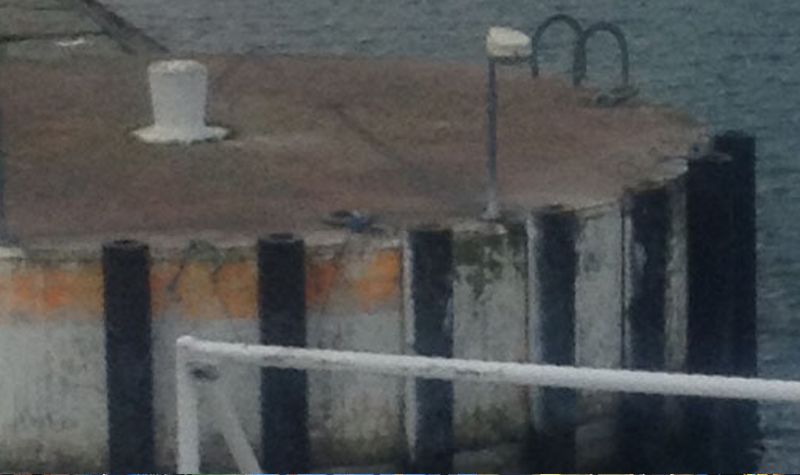 It is called Tanger Med 2. 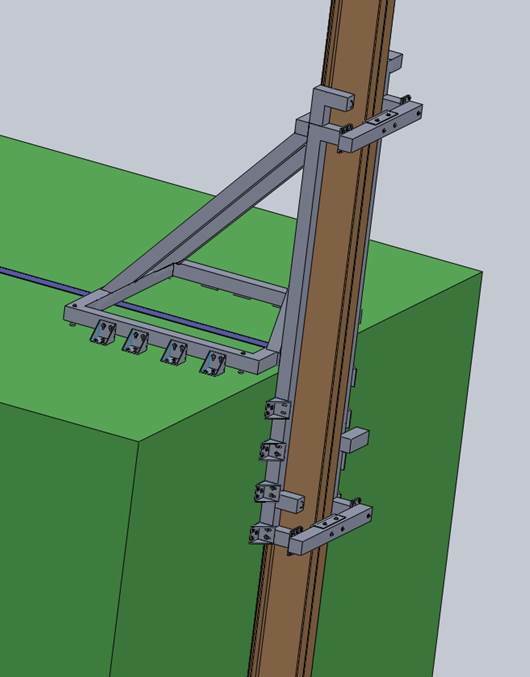 The work is led by TMBYS.